I made my first batch of soap a little over four years ago. At the time, the idea to make soap was completely random and stemmed from one of those lounging on the couch with your mom, drinking wine, scrolling Pinterest, contemplating life moments. At the time I was 27 and unfulfilled with my current line of work. I was looking for a change and had no clue what I wanted to do other than “make stuff.” I possessed a love for baking and a passion for natural skincare and then… light bulb I had an idea…. “Mom, I am going to become an esthetician, help people with their skin, and make soap!” “Soap? Why soap? You don’t even use bar soap. You are allergic,” my mom responded. But the idea was planted and I was going for it. I spent the following few days obsessed with the idea. 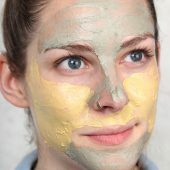 I googled everything soap and skincare related and stumbled upon Anne-Marie’s Soap Queen blog. 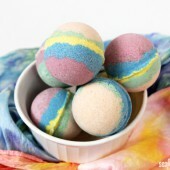 I watched every video possible, read how-to blogs, and ordered a few soapmaking books from Amazon! A few weeks later for my birthday, my mom gifted me a cold process soapmaking kit from Bramble Berry. I was so excited! I opened the box, started to work through the recipe, and made my first batch of soap. I was instantly hooked! The rest is history…. What advice would you give makers just starting their businesses? Start small but plan big! Know your numbers and account for your time! 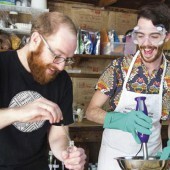 Soapmaking as a hobby is completely different than running a sustainable business. Before you embark on selling soap or think about creating a handcrafted business, you need to have a solid plan and understanding of things like the real cost of goods (including your labor and overhead), production procedures and timelines, inventory control, waste management, branding and marketing, customer service, and the laws and regulations that pertain to you depending on where you live and conduct business. I recognize as makers we get excited, create, and want to share it with the world. However, taking the time to have a plan in place and a good understanding of the business side will help you stay on track, focused, and eventually profitable. S.O.A.P! I enjoy pouring balms, soy wax candles, and packaging gift boxes, but cold process soap is my favorite product to create. Each batch is unique and one of a kind. 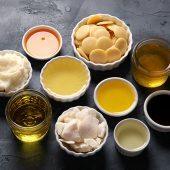 You can fully customize your recipe and do away with the use of toxic chemicals, parabens, fillers, and commercial skin-stripping additives. The best part is that you can tailor ingredients to satisfy the needs of different skin types, allergies, or client concerns. 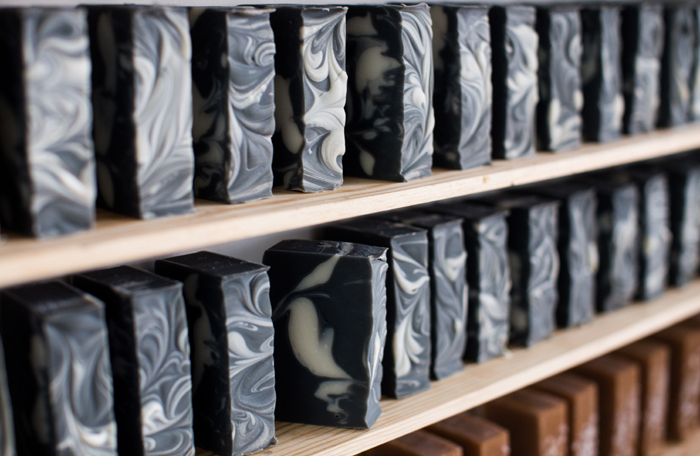 Take the time to educate yourself about the soapmaking process! Do research, watch videos, and become a student of the craft. 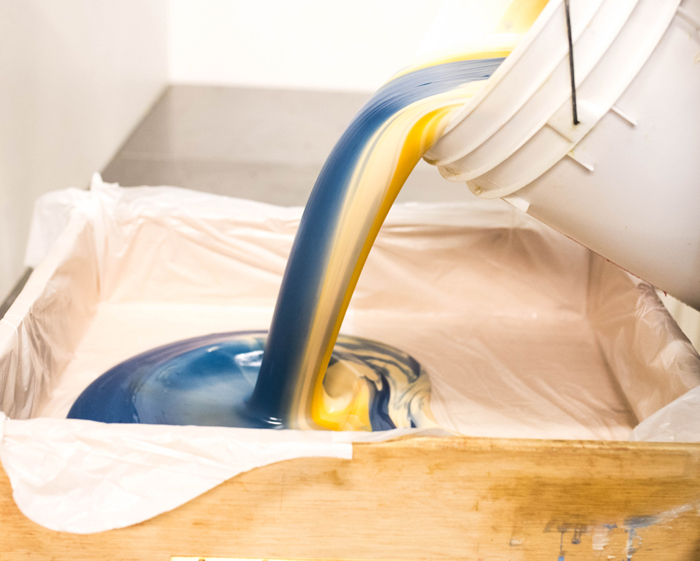 Understand the importance of lye safety, SAP values, and how to troubleshoot if and when your soapy creation doesn’t go as planned. Deciding on a business name is exciting, however, it can be a little daunting – especially in a saturated market. I exhausted multiple names, email domains, and label templates, but I was never fully satisfied with the business name I chose. A few months after I had a deadline to finalize a website purchase and branding collateral, but I couldn’t pull the trigger. I knew that my current business name was not in alignment with what I wanted to create. I wanted something fun and cheeky, eco-friendly, yet natural and feminine. After a long day of esthetic class, I stopped by Michaels Craft Store looking for inspiration. Cruising down the middle aisles I stumbled upon alphabet letters. 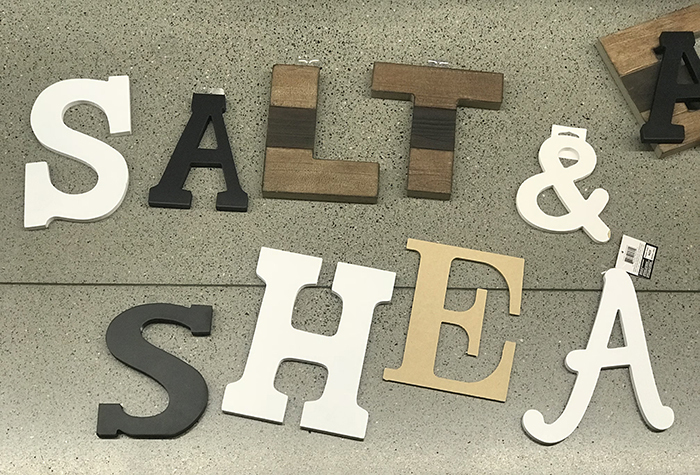 I pulled out tons of letters and started piecing words together in the middle of the store. I was currently soaping with a lot of shea butter and seeing the letters sparked an idea. After a few times of ring-around-the-letters and a lot of word play, Salt & Shea was born. I knew I had to create it! I find inspiration everywhere. My mind operates on a burning desire to make something. Most of the time I have moved onto a new idea before fully processing the last. My friends, family, and current clients always fuel my creative spark and really keep me going. I guess it comes back to the joy of creating something that someone else will find happiness in. I enjoy almost everything Bramble Berry! 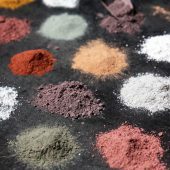 My favorite products they offer are their natural colorants. 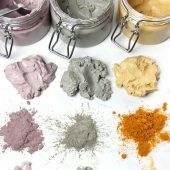 They provide a large selection of plant-based powders, clays, and exfoliating additives. My favorite is the purple Brazilian clay. I have found it to be hard to source, so I love that I can get it from Bramble Berry when I place my normal orders. 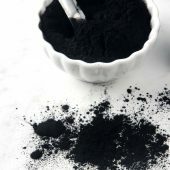 It provides a natural vibrant color and adds mild exfoliating properties to the soap. 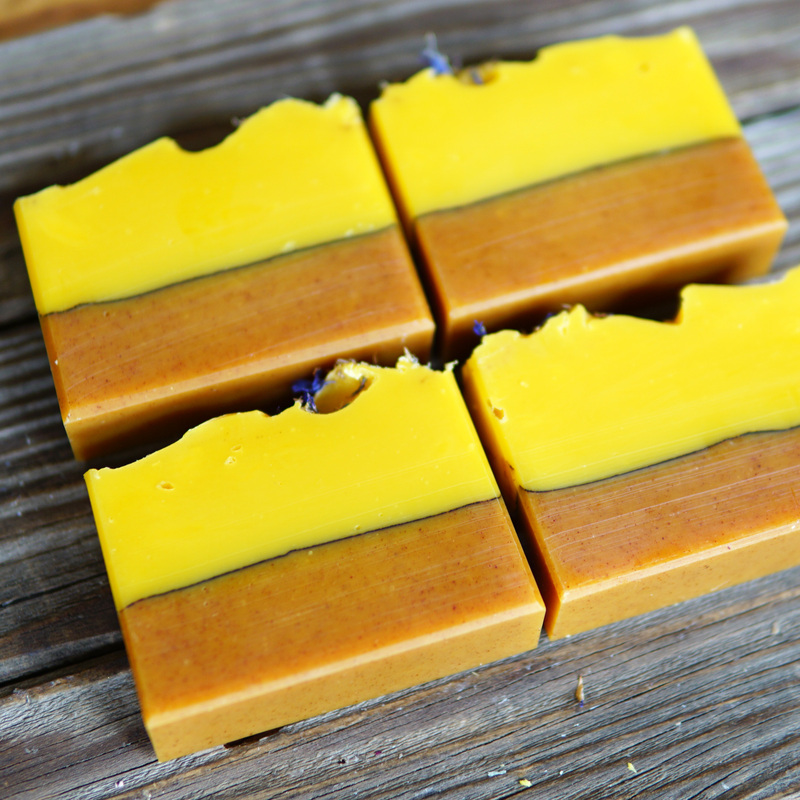 I love using it in our Lavender Lemongrass bar. It’s one of our top sellers. What is something unusual or unique about you? I’m allergic to everything! I have Celiac disease and have suffered from extremely sensitive skin due to allergies and environmental elements my whole life. Growing up I was allergic to commercial bar soaps, body wash, bubble bath, and pretty much anything that smelled good. I never had the “ luxury” of taking a bath or trying that new lotion or body butter without sending my skin into a complete freak out. I believe my personal experience of navigating life in an “allergic” state puts me in a unique position to understand and show compassion for other people’s sensitivities. When I’m not creating for Salt & Shea, chances are I am fussing with another DIY “crafty” project. Most of the time you can find me in our garage working with wood, staining crates, and sanding old furniture. My love for wood has definitely influenced my brand and packaging, and it’s something I am really proud of. I also love walking my two dogs, Tyson and Dallas, baking gluten-free treats, and spending quality time with my boyfriend hiking outdoors. If you could give one product to a stranger, what would you choose and why? That’s simple! 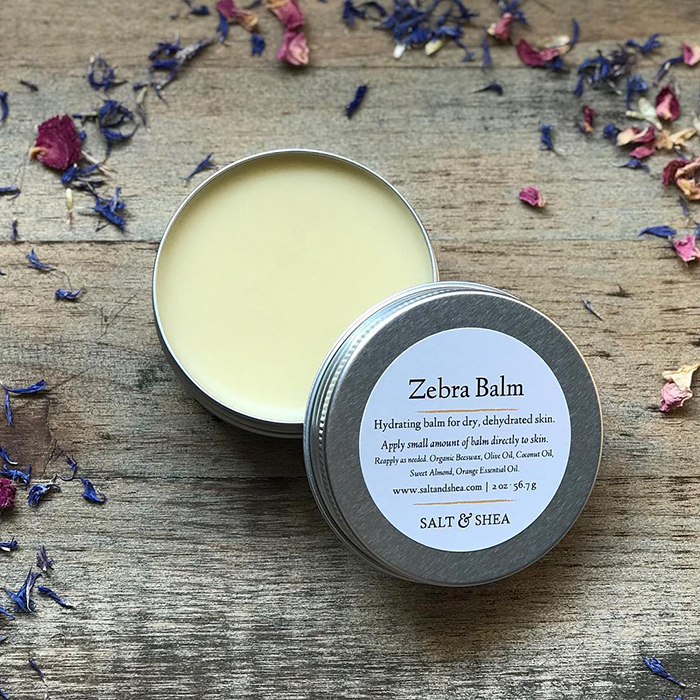 It would definitely be our Zebra Balm (hydrating balm for dry skin). 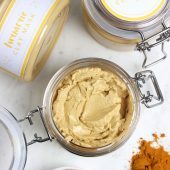 This hydrating balm is skin happiness in a tin! It’s a proven and true favorite among our clients, and it’s my personal favorite product. 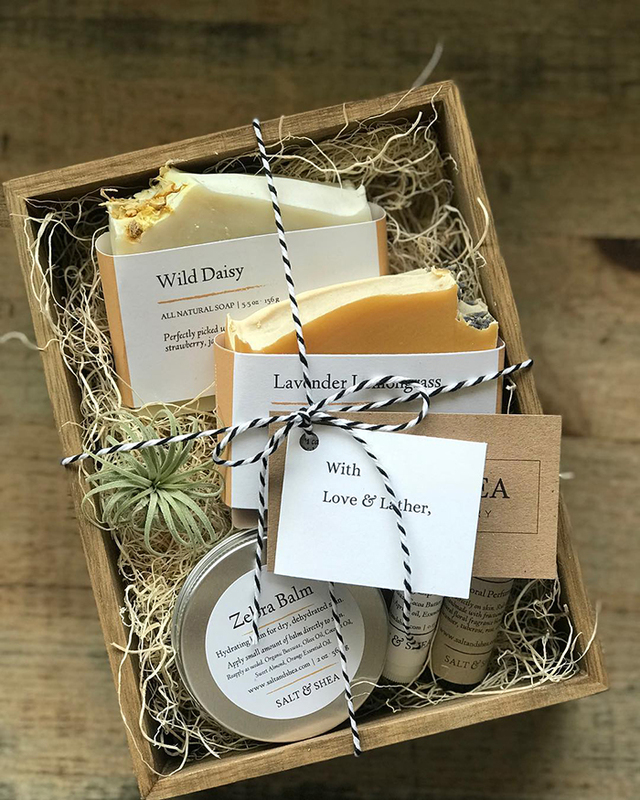 It’s carefully crafted with organic beeswax that we source locally and skin-loving oils to help hydrate and protect dry, dehydrated skin. I enjoy creating and gifting this balm so much because anyone can use it and everyone loves it! Not only does it smell divine, it leaves you feeling happy, healthy, and hydrated! Have you ever experienced a soapy fail? What did you learn from it? My biggest soapy fail involves 20 pounds of soap, a 5-gallon bucket, a stick blender that didn’t get to the bottom, and a huge mess. I normally soap 15 pounds at a time, so I figured 5 more wouldn’t hurt. I made my lye, portioned my oils, and added them to a 5-gallon bucket. I should’ve known I was in trouble before I started when the bucket on top of my workspace was almost my height. Ignoring the obvious, I grabbed a step stool, poured my lye, and went to town. Keeping with the theme of ignoring the obvious, I didn’t account for my stick blender being too short or producing enough powder to reach the bottom to fully emulsify and trace. In the time it took to grab a few buckets to portion out some of my batter, my essential oil blend started seizing. 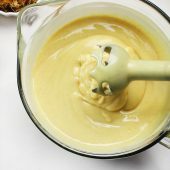 I quickly tried to whisk the batter enough to save and pour. The whole batch was literally a nightmare! If I learned anything from this soapy fail, it would be to know the limitations of your current situation. I planned for a bigger bucket, but forgot about the rest of my equipment. As a maker, I have a deep love and respect for the handcrafted process as a whole. I appreciate the opportunity to create and I am proud of what I make. What I love the most is the joy that fills my heart when my clients and new customers come back and tell me how much they loved Salt & Shea, the difference they see and feel on their skin, or how they felt when they gifted one of our boxes. To me, it’s so much more than making soap or creating body care, it’s about making someone feel good! It’s my favorite part of the whole process! 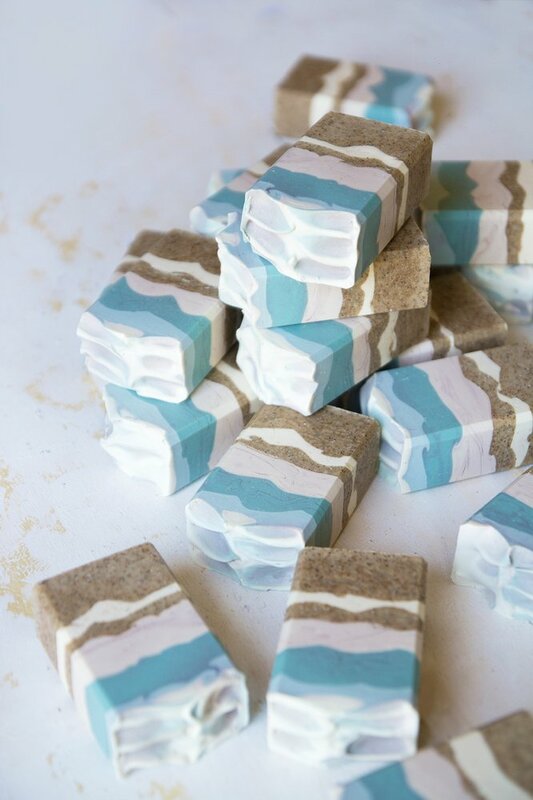 Meagan of Avery Grey Soapery is known for both sophisticated and whimsical cold process designs. 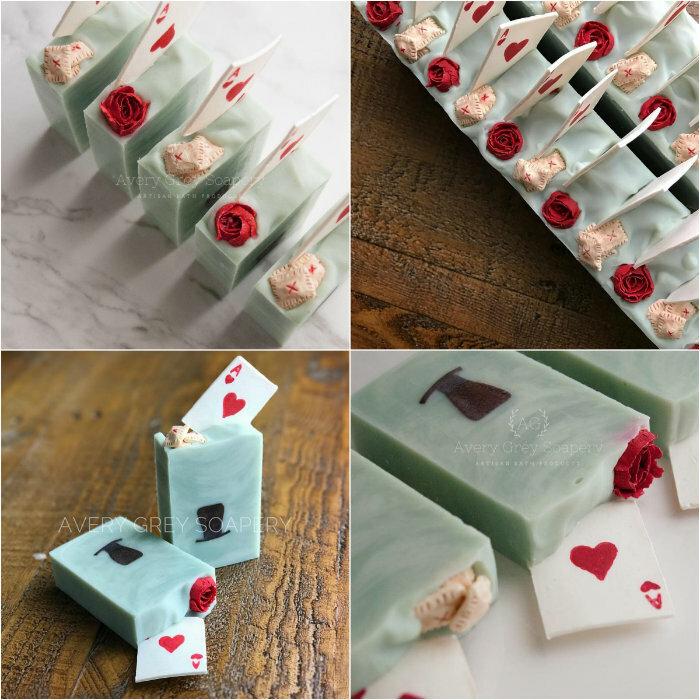 Her love of movies, books, and music often inspire her creations, leading to playful projects like Mad Hatter and Maleficent soaps. We love to see what she creates on her Instagram. 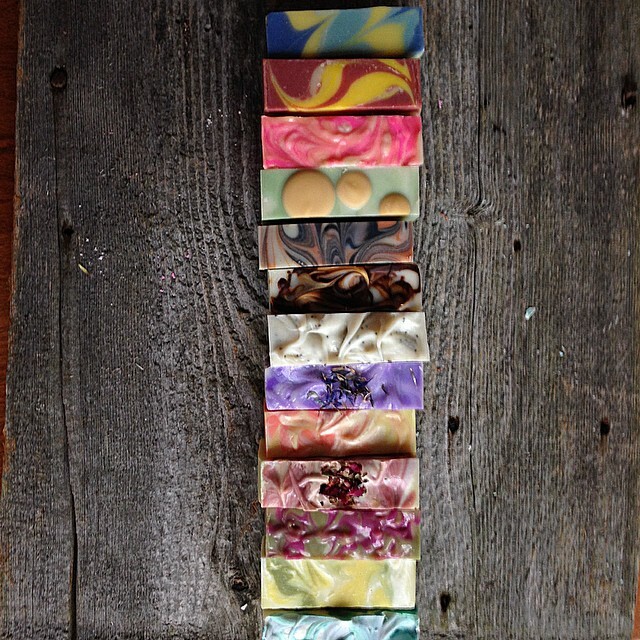 Learn more about how Meagan got started making soap and what she learned along the way. 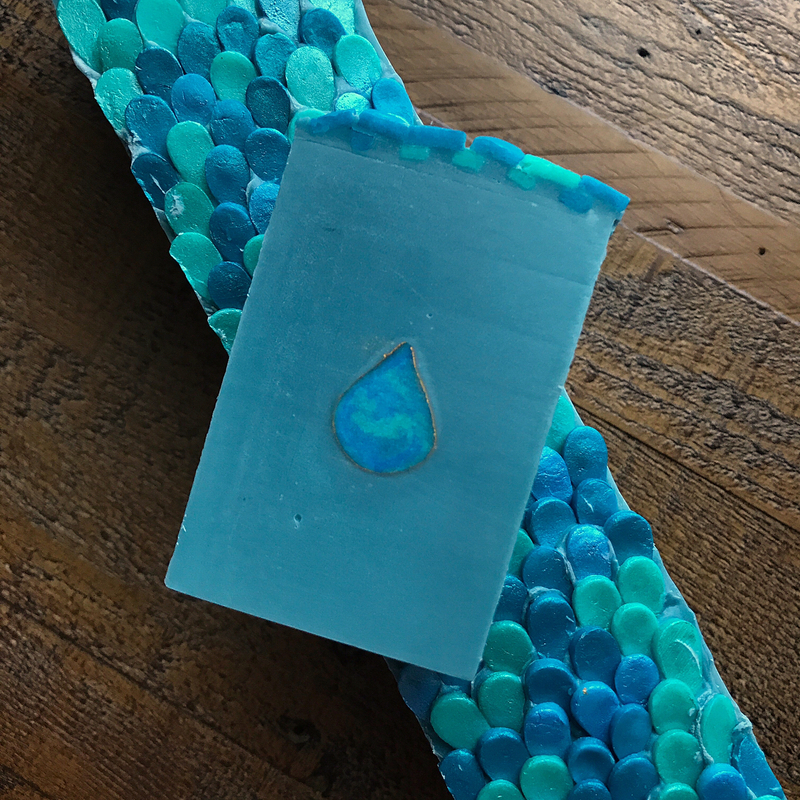 Meagan’s Siren soap. She was inspired by the original story of The Little Mermaid, written by Hans Christian Andersen. How long have you been soaping and how did you get started? I’ve been soaping for a little over 6 years now. I’ve had a love for handcrafted things ever since I can remember. I once made my grandparents sit and wait for me while I watched a man make moccasins completely by hand, start to finish, from leather that he tanned himself. So, almost 10 years ago I found a tutorial on soap making in a book that my grandfather had. It was full of other hand crafting tutorials, but something about soap making interested me. I spent years researching because I was so intimidated at the thought of using lye! I wanted to have all the information I could possibly find before I made my first batch, and once I finally took the leap, I fell in love. Coffee soap, made with freshly brewed coffee and coffee grounds. I would say to not be afraid of starting small or starting slow. You don’t have to come out of the gate with huge product lines and numerous scents. Have a vision of what you want your business to be in five years, in ten years. Think about your full potential. Keep your vision in mind and work towards it. Start with one product, don’t overwhelm yourself immediately. Do your research on your products, get opinions from friends and family, and test everything. And remember, it’s ok to take a break! It’s easy to get a little burned out, especially after the holidays, so don’t be afraid to take time off every now and then to rest and regroup. You’ll be better for it, and your business will too. 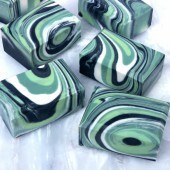 Mad Hatter soap, fragranced with green tea and cucumber. Soap is absolutely my favorite product to make. I enjoy bath bombs, body scrubs, and other products, but soap is my love. Every batch turns out different, even when I try to make them as similar as I can, it’s always a mystery. I’m always so excited to cut into a new loaf. What will the inside look like? Will it turn out like I planned, or maybe be something even better? It’s a fun surprise each time. 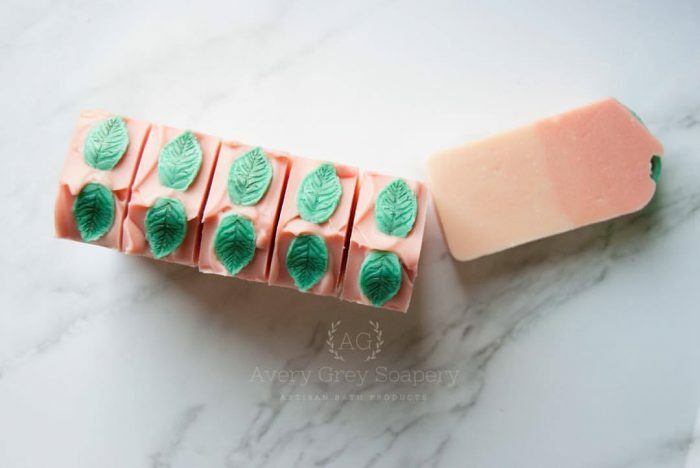 Georgia Peach soap, topped with leaf soap embeds. So many different things! Sometimes it comes from books or movies like my Mad Hatter and Maleficent soaps. I have a huge list of concepts waiting to be made that were inspired by some of my favorite book characters. I pull inspiration from photos, from sunsets, from music. 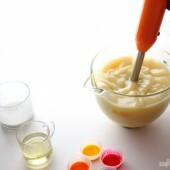 I have so many photos saved because the colors in them make me want to recreate them in soap. Music makes me want to make things. A friend and I were discussing our favorite music from high school, and it resulted in my 80’s Baby Soap! Sometimes I have no clear plan when I order a fragrance, but the first time I smell it I immediately know what I want to make and what it should look like. 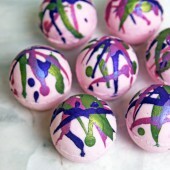 Recently I pulled from my heritage and let Mardi Gras inspire me, and Voodoo Woman and Mardi Gras soaps were created. I wrestled with a name for the longest time! Nothing I came up with sounded right, and nothing my friends and family came up with sounded right either. So, I finally decided to name it after my children. My husband and I could only agree on a first name for our oldest, and we ended up letting my mother choose his middle name, so he’s Hayden Avery. When our daughter came along we found ourselves in the exact same position, agreeing on a first name but not being able to come to a compromise on a middle name. So again, we let my mother choose, and we have Adeline Grey. Using their names was a way for me to bring three generations into one. My mother is a huge supporter, so it felt right to use the names she chose for my kids to name my business. I do this for me, but I also do this for my children. To set an example for them so that they know they can accomplish what they put their mind to. And naming something so important after the most important people in my life seemed a perfect start. Maleficent soap. Scented with an absinthe fragrance and topped with Aurora’s crown and Maleficent’s staff. I absolutely adore the Cactus Flower Fragrance Oil. It’s a little sweet and floral without being overpowering. It’s one of those fragrances that makes you stop and smell it every time you pass it on the curing rack. My husband and son asked to keep the whole batch I made with it! I’m normally not a big fan of floral fragrances, but this one won me over as soon as I twisted the lid open. I am an extremely forgetful person. I have reminders, calendars, sticky notes, and notebooks to remind myself of everything I need to do. And yet, I can remember every book I have ever read, and the words to any song I’ve heard more than 5 or 6 times. I have to wait years to re-read a book so that I forget enough of the details to find it interesting again. I also read extremely fast, and my average number of books I read a year is about 250. And when it comes to music, my sister and my son like to play a game where they play songs they know and see if I know the words. I always win! 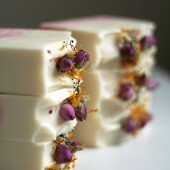 Lovely Lavender soap, topped with pink Himalayan salt. Well, you know I love reading and music. I also like to quilt, knit and paint. I’m a bit of a craft-a-holic, I pick up hobbies left and right! History is another interest. I love to learn, especially about other cultures and ancient civilizations. I love to travel, and I’ve been to almost 40 states and 4 other countries. Montana is my favorite place (besides home), and I hope to one day travel to Greece where I can combine my love of history with my love of travel. Have a backup plan! Sometimes things happen, our batter thickens up more than we’d like, a fragrance accelerates, or a color morphs. Have a back up plan just in case so you can move seamlessly (more or less) from one plan to another. And don’t be disappointed when you don’t get to execute your original design. 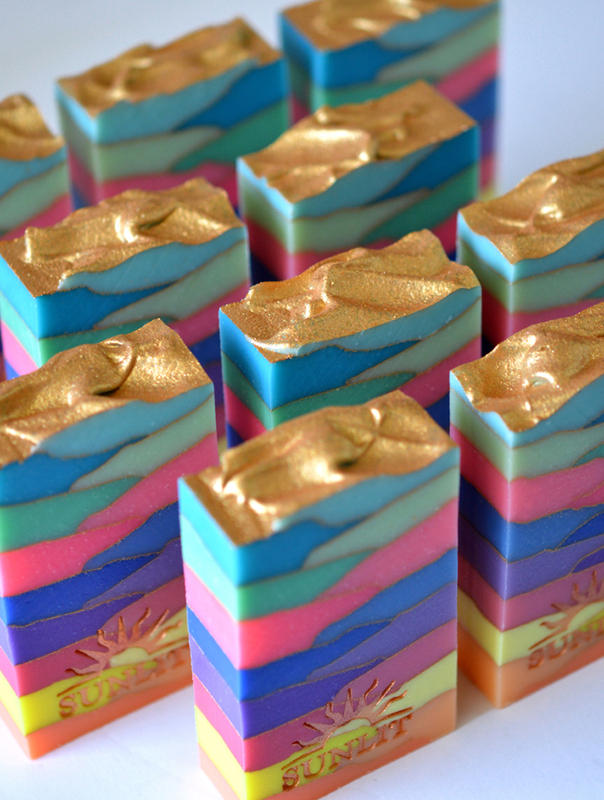 Sometimes a soapy design fail can be one of the most beautiful soaps you’ve ever made! North Pole soap, created with Tussah silk. I definitely have had a few horrible fails. For one of them, I had grand plans for a sea fragrance that I was madly in love with. I was going to have some complicated swirls, a textured top, oh! It was going to be gorgeous. Ha! The reality was that as soon as I added that divine fragrance I ended up with soap on a stick. Or several sticks really, as I had already separated my batter into 4 different colors. In the end I smooshed all four colors together in the bowl and crammed it into the mold. I’m pretty sure I could have won an “Ugliest Soap” contest with that one. But, I learned to always, always pay attention to the fragrance description and reviews. If I had, I could have had a successful, albeit plainer, soap. Another fail I had was because of a fragrance. I had a customer request a custom loaf in unicorn colors. I grabbed a fragrance that I felt went with a unicorn theme and went to work. Well. It really helps to check and make sure your fragrance doesn’t discolor when you make a soap with pastel colors. After a few days the bars looked like I had made them with a camouflage theme. Definitely not the delicate unicorn colors I started with, haha! Top left, clockwise: Rainbow, Tonka Bean Noir, Blackberry Magnolia, Plain Jane. If I could give one of my products to a stranger, I would probably choose one of my latest. Right now, I’d pick Voodoo Woman. The fragrance is one of my current favorites, and the colors are beautiful. It’s Mardi Gras, but a little dark and mysterious. I always think the last soap I make is my favorite. Then I make another and I think to myself, oh, this is definitely my favorite. So far, Voodoo Woman is holding out as a top favorite! I love making people feel good, about themselves and just in general. Especially moms. I hope that when someone uses my products it brings them joy. That it helps them find a little peace in a day that may not have had any, or has had very little. I also love the complexity of creating new products. I have a notebook that is absolutely filled with recipes, ideas and concepts for one product or another. Putting together a concept from beginning to end, from the recipe, to the fragrance, to the colors and design is so much fun. And seeing it come to life is amazing. When someone loves something that I created, it makes me so happy! 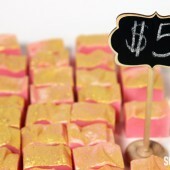 Mustache soaps, created for a baby shower. 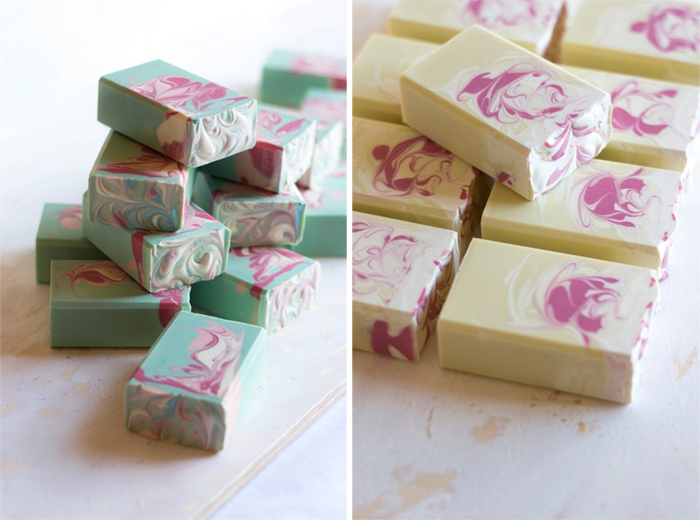 Simi of Muddy Mint lives in Colorado where she creates beautiful soap. She sells her products online and co-owns a retail space called Mud & Madder with a friend who creates ceramics. 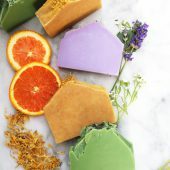 She utilizes the power of natural colorants and essential oils to create soap that looks amazing and benefits the skin. 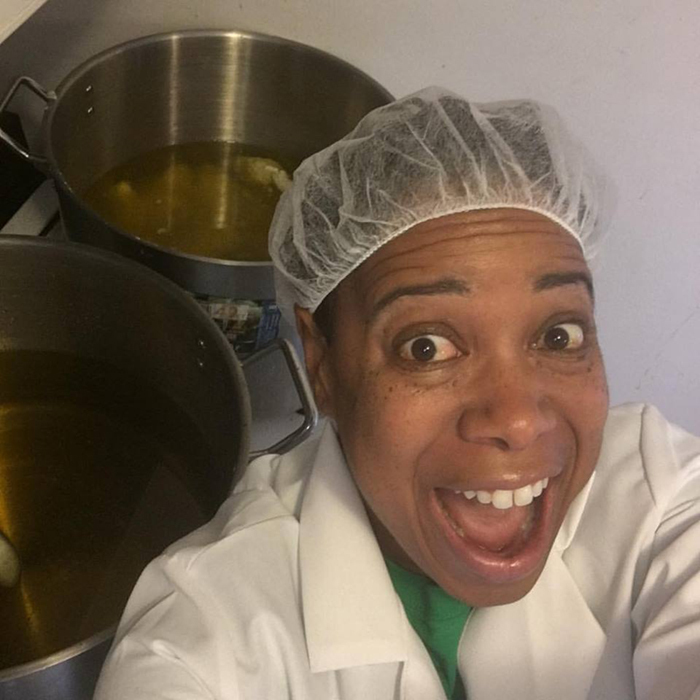 Learn more about how Simi got started, what inspires her, and her soaping tips. 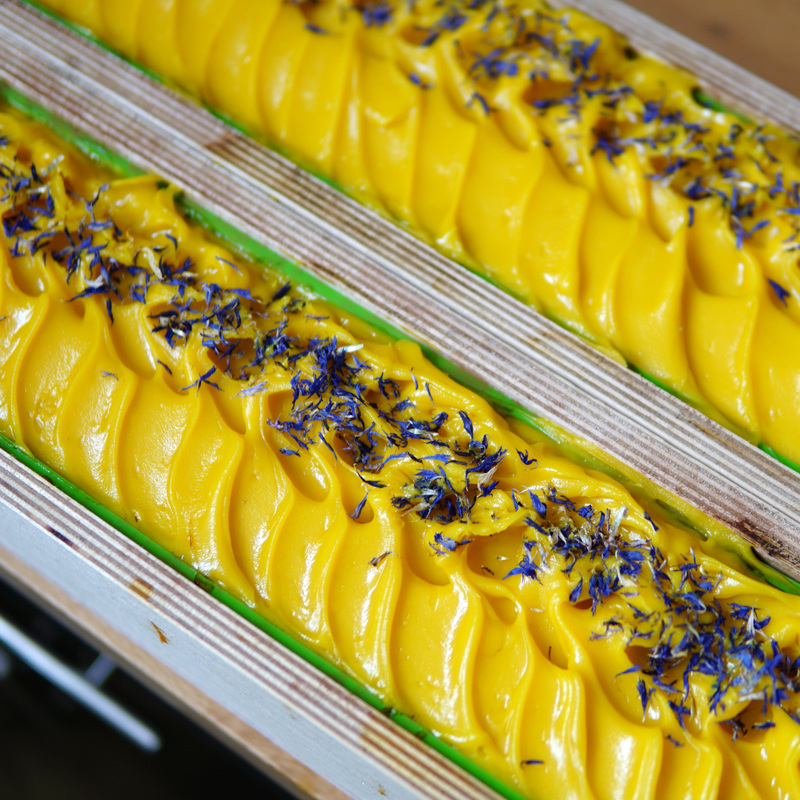 Turmeric & Carrot Soap topped with cornflower petals. I made my very first soap on May 5, 2016 (I know because I posted it immediately to Instagram!) 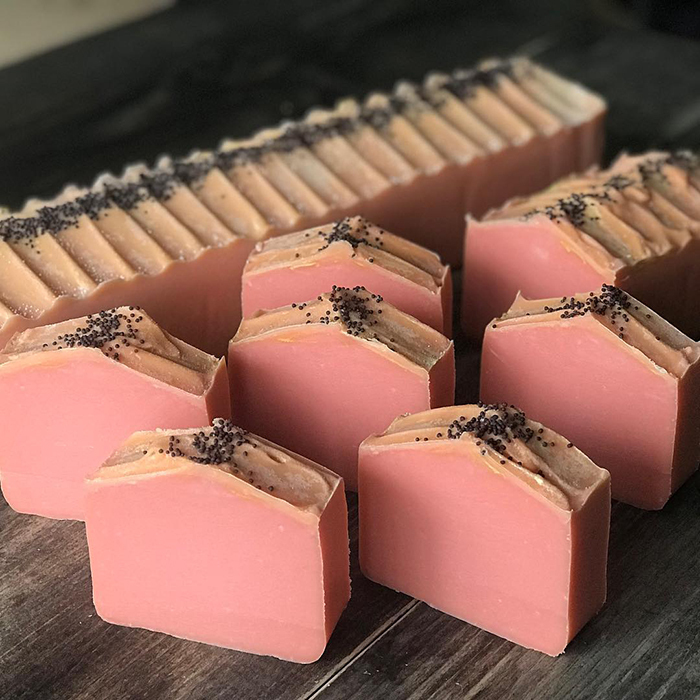 It was the Beginner’s Cold Process Soap Kit from Bramble Berry and it was probably the easiest soap I ever made, which might have you scratching your head. To understand, you have to back up a bit. 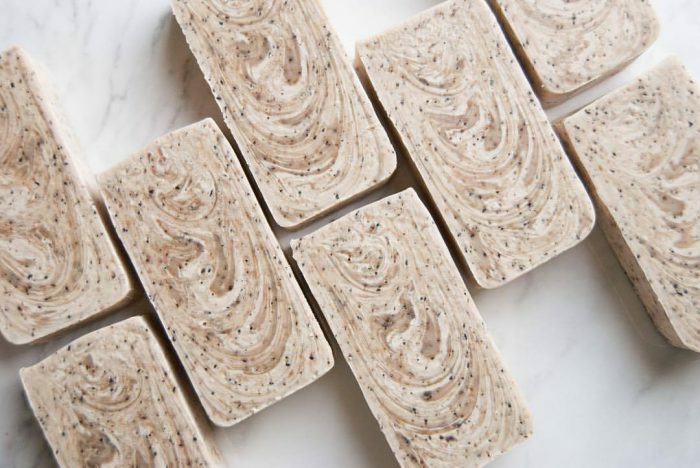 A few months before that day, I was looking up how to help alleviate dry skin and came across the idea that handmade cold process soap might help. I immediately turned to Etsy and bought some soap from two fantastic soapmakers: Mirasol Farm and Artisan Bath & Body. After the very first use, I was hooked. My dry skin improved and the lovely new scents in my shower had me sniffing my skin all day. I started to obsess over the idea of making my own soap. This led me to binge-watching Anne-Marie on YouTube. I’m pretty sure I watched every single cold process soap video she made and then, finally feeling confident, I bought the kit from Bramble Berry. By that point, I felt I could make soap in my sleep, even though I’d never mixed lye or held a stick blender. When the time came, I was super prepared and found the whole thing very easy. So, I kept going. 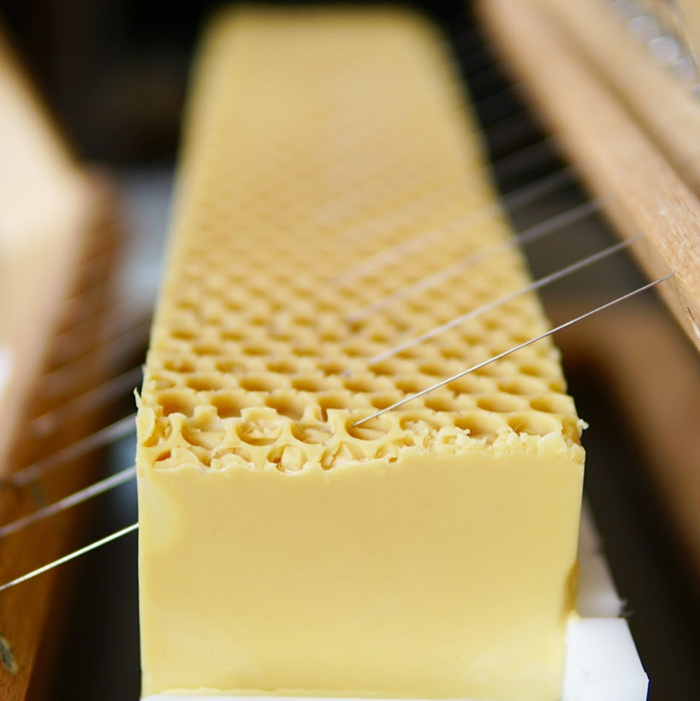 A loaf of Oatmeal Milk & Honey Soap being cut into bars. I would say, go slow and make sure you love what you’re making. 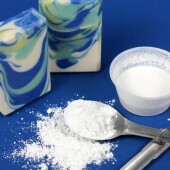 Use reliable recipes and understand the simple concepts of soapmaking before you dive too deep. 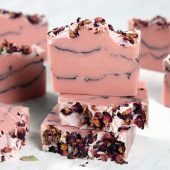 When I first started, I had a recipe I loved (it was the Bramble Berry Creamy Orange Soap) and a recipe that my mom loved (my mom tested all my soaps early on and gave me detailed notes on each one). 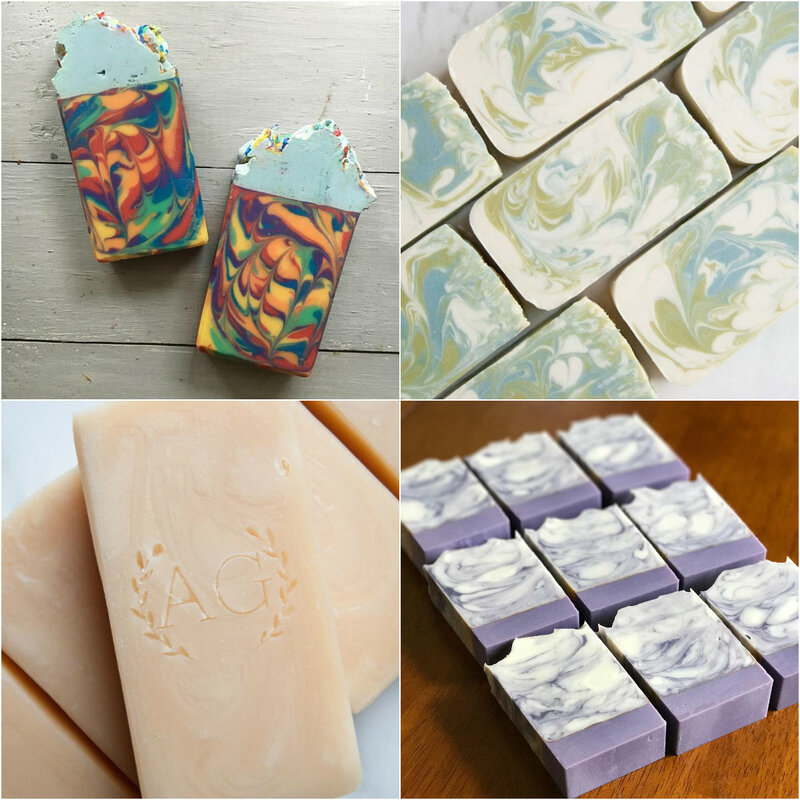 I opened an Etsy shop in August 2016 with only our very favorite soaps and as I continued selling soap, I made sure that several people tested my bars before selling. I also received so much incredible advice and encouragement from other soapmakers on Instagram. This warm and welcoming community has made a huge difference in my business by providing advice, keeping me interested, and injecting me with a huge dose of daily inspiration. And, as with any business, customer service is the number one thing. Far more important than any other aspect of your business. Reply to your customers ASAP, package things well to make a good impression (don’t just throw your soap in a bubble envelope! ), ship as quickly as you can or keep your customers informed of when you’re shipping, admit when you made a mistake, and be nice. All natural, cold process soap is by far my favorite. I went through a huge experimentation phase with my soaps in 2017 as I moved away from using palm oil and started formulating my own soap recipes. 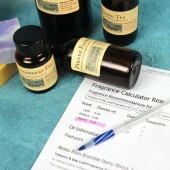 SoapCalc was my best friend and I spent countless hours trying out different combinations and doing research. It was so much fun, because researching and learning is at the heart of everything I love doing. Every time a new recipe finished curing, I was so excited to see how it would feel and lather compared to the last. I also switched almost exclusively to essential oils, which was a huge learning curve as well (I’m still working on it!) 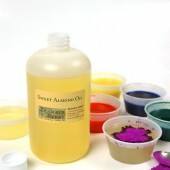 and using all-natural colorants. There’s so much territory to cover that you couldn’t possibly get bored with it. 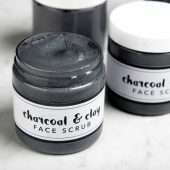 Charcoal & Tea Tree Bars and Sea Clay and Charcoal Facial Masks. As I mentioned earlier, the experimentation! 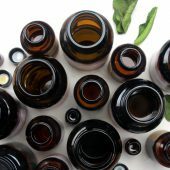 I like to research different ingredients and think about how I can use them together and what properties that ingredient would bring to a soap. I’d say I’m more of a functional soapmaker (as opposed to an artistic one). 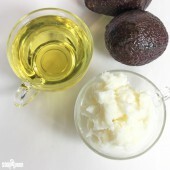 For example, a few years ago, I accidentally came up with a recipe for a soap that became very popular because it didn’t contain any shea butter or tree nut oils. It was something I hadn’t really thought about before, but I had a lot of people telling me how great it was that I made a soap like that. It is now part of my main product line. 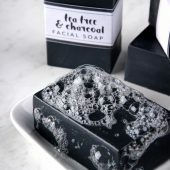 I also did extensive research on my Charcoal & Tea Tree soap recipe to really try to make it a great facial soap. 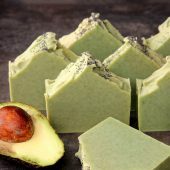 I tend to focus a lot on the base soap recipe and one of my challenges right now is that I have a lot of different ones and I need to streamline it quite a bit to boost my productivity. Simi’s adorable soaping space in Colorado. The name Muddy Mint comes from my mom’s garden, which has also been an inspiration to me. My mom is a fantastic gardener and she is very interested in growing native plants and herbs. She lives in Ottawa, Canada (my hometown) and I was thinking about how the herbs, like mint, look after a big rain. All splotchy and muddy and naturally beautiful. 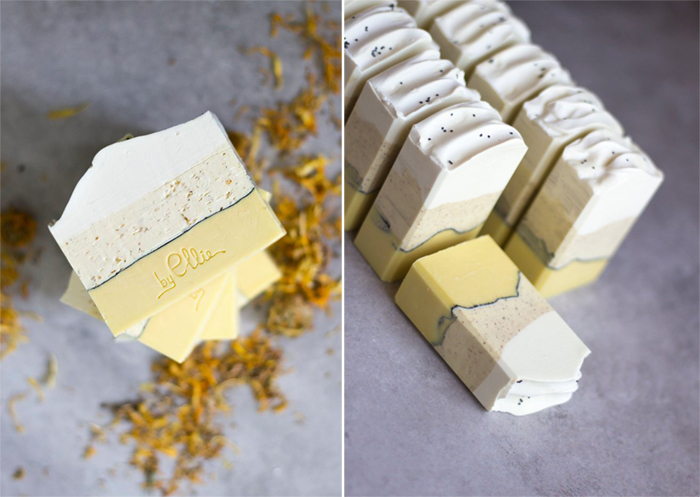 My dream is to live near her and have her grow all the herbs and plant-based colorants for my soaps! I have a lot of favorites, but the product I always have to have in stock is the Orange 10X Essential Oil. It sticks so well in cold process soap and has a gorgeous natural orange scent (and a beautiful natural color!) It’s fantastic for blending with both essential oils and fragrance oils (try it with Champagne for a Mimosa Soap!) I haven’t seen another 10X Orange Essential Oil anywhere else, so I’m always stockpiling this one. Sweet Apple Cider Soap. The color from this batch came from exclusively from apple cider. I grew up speaking three languages! French, Punjabi, and English. I have recordings of me as a little kid switching between all three. Sadly, I’ve lost all of my Punjabi and my French is pretty rusty these days, even though it was my first language. I co-own a store called Mud & Madder with a friend of mine that makes ceramics. We have our studios there as well as a small retail space with our handmade products. 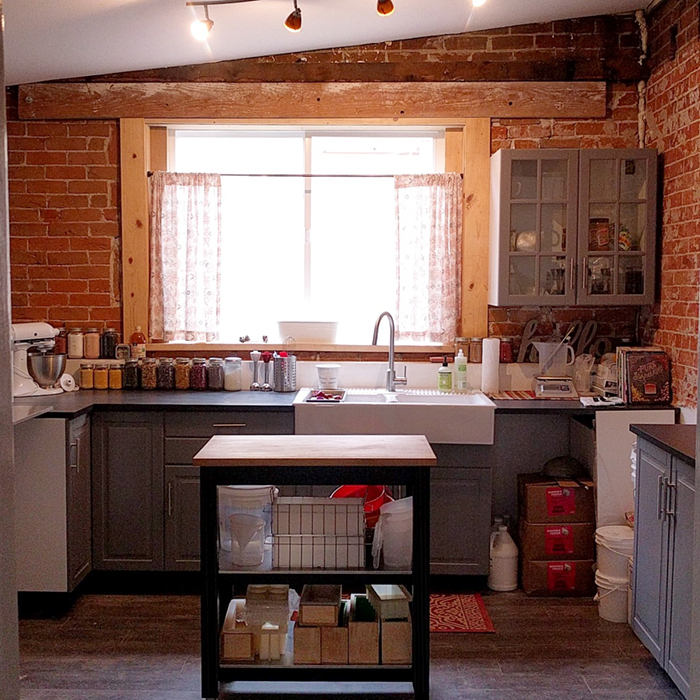 It’s been a lot of fun to run a business with a physical space and to collaborate with another maker. We’ve met so many interesting people and I’m finding it very different to run a brick and mortar than to sell online. The rest of the time, I’m a mom to an almost 12-year-old boy, so we bike around, go for hikes, and play in the creek, since we live in beautiful Colorado. I also turn into a crochet addict every winter! 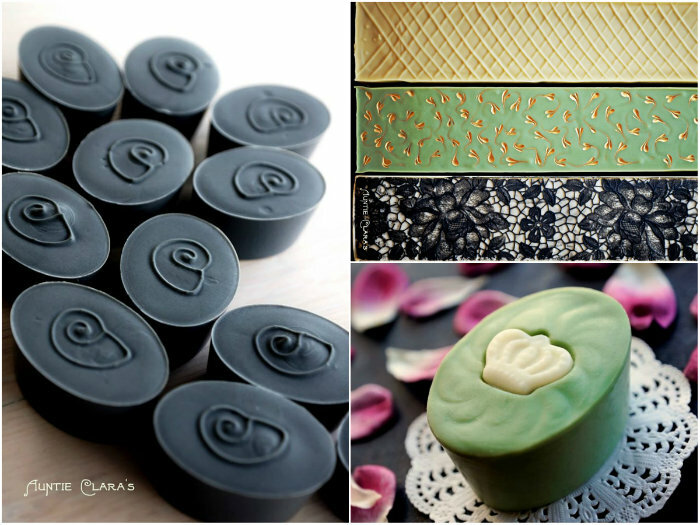 Top left, clockwise: Coconut Rose Soap, sample tins of soap being packaged, Champagne & Orange Soap, a collection of Simi’s soaps. 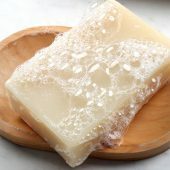 Try soaping cool, like under 100 degrees or room temperature. I feel like when I started doing that, things got much easier on many fronts. I’d also say, don’t be afraid to play with your recipes, experiment, and test out what happens. 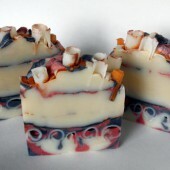 Take something you know works and tweak it just a little to see how it changes your soap. Then, keep going. Oh, and also, always write everything down, even if you think you’ll never make that thing again. Use a notebook instead of a scrap piece of paper that will inevitably get lost – I know from experience! Yes! I’ve had quite a few failures, but sometimes when I cut the soap they turned out okay. But, I did get a mini soap volcano once when making a soap with pumpkin puree. I was soaping pretty hot, as it was early on in my soapmaking, and I added the pumpkin puree to my batter and all seemed well. I poured my batter into my mold and was working on the top, when all of a sudden, the hot gooey inside of the soap started to ooze out the top! My white top was destroyed and I was spooning chunky batter back into my mold. Eventually it stopped, so it wasn’t too bad, and I ended up with a very rustic looking soap. My experience with soapmaking is that almost everything is salvageable. 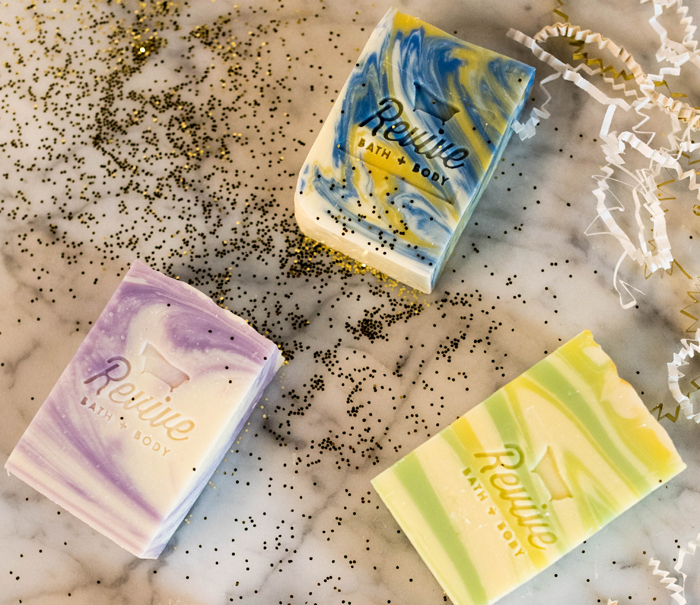 The end result is still a soap that is made with amazing ingredients and even if it isn’t the prettiest soap in the world, it’s still a good soap. 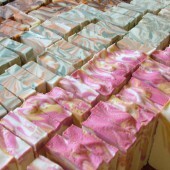 I almost always sell my “ugly soap” (although I’d never sell anything lye-heavy of course!) I also learned to soap cool after that incident and I have rarely had any issues since. But, I also don’t try to do a lot of complicated patterns, so my soapmaking is pretty basic compared to some soapmakers out there. 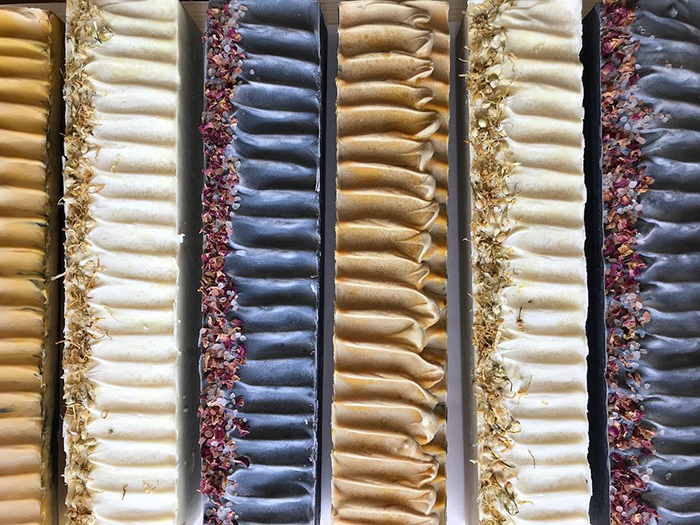 Simi’s naturally-colored soaps. From bottom to the top: turmeric, carrot juice, purple Brazilian clay, rose clay, activated charcoal, and madder root. Assuming they didn’t have any allergies or fragrance sensitivities, I’d give them a bar of my “Garden Mint” soap. 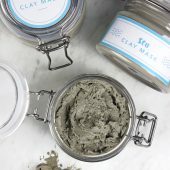 It has oatmeal and crushed peppermint leaves for light exfoliation, a blend of peppermint and spearmint essential oils, which is really pleasant but also a little tingly, and it’s all natural, vegan, and palm-oil free. 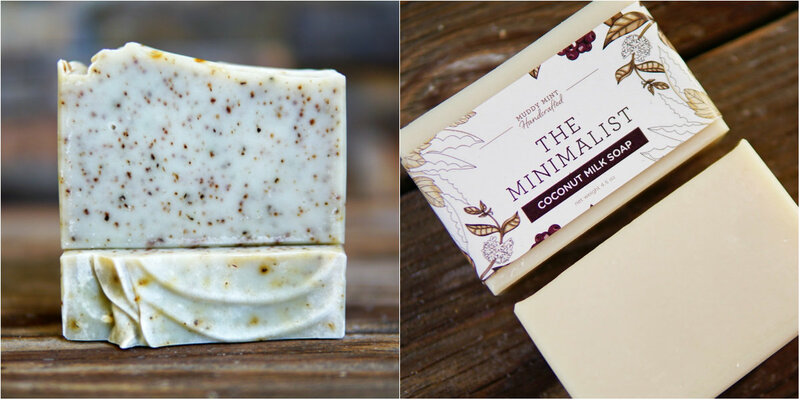 For someone with very sensitive skin, I’d give them “The Minimalist,” which is a tree-nut free soap made with coconut milk. 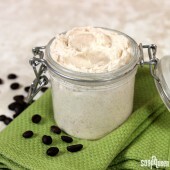 It’s unscented, but very creamy and wonderful in the shower. It’s one of my favorite soaps. I love the research and experimentation. It’s actually a little problematic as it takes me a long time to release a new product (non-soap product, that is), since I’m always looking for that perfect balance of simple, beautiful, and functional. But, if I don’t get to play and learn, I get bored, so I’m glad that it’s taking me a long time to figure stuff out! 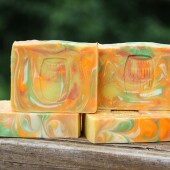 Turmeric & Carrot Soap, scented with orange and clove essential oils. Toushonta Hogan started her company, Scentsational Soaps, in 2007. 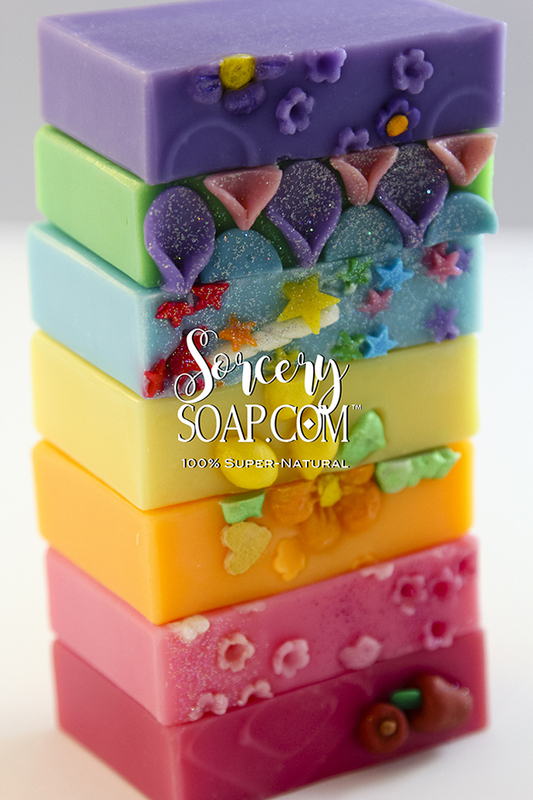 Scentsational Soaps focuses on using natural ingredients to create soap, candles, body butter, scrubs, and more. Toushonta sells her products in a variety of ways, including online and wholesale. 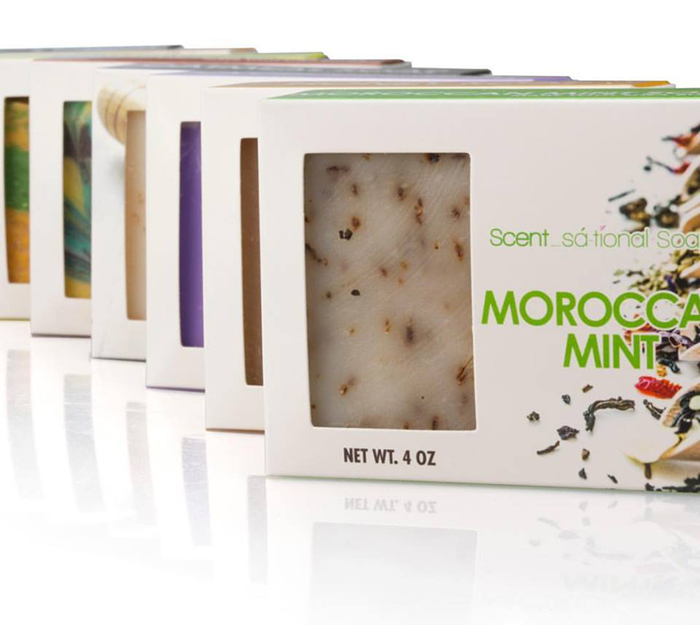 Recently, several Target stores in California started carrying Scentsational Soaps! Learn more about Toushonta and her creative journey in the interview below. I’ve been soaping for 10 years and got started after receiving a wholesale order after trying my hand at melt and pour soap. I would advise soapers who are just starting their business to get involved in conferences, meet-ups, and Facebook groups. They are both beneficial and an awesome way to meet other creatives and develop lifelong relationships. Toushonta Hogan, the founder of Scensational Soaps, creating a batch of cold process soap. My favorite type of product to make is soap. It’s so therapeutic. 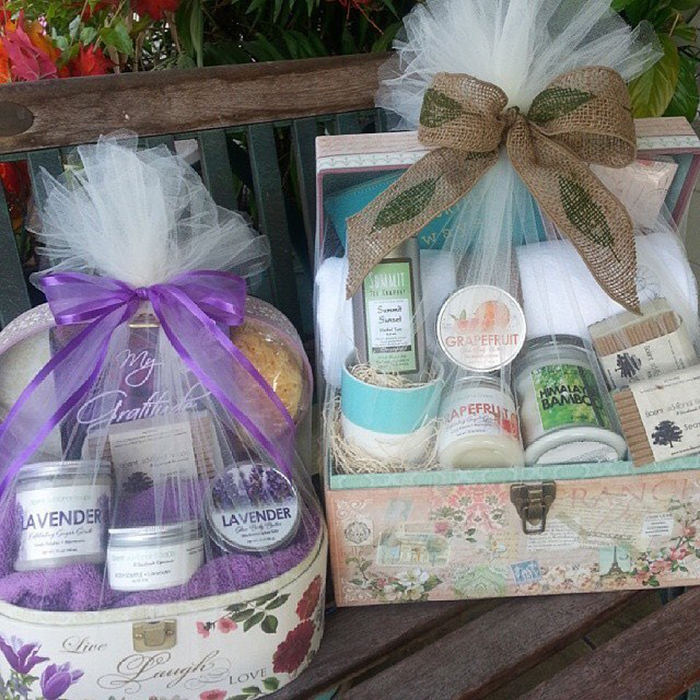 Beautiful baskets of Scentsational Soap products. So many things inspire me to create. The weather, my atmosphere, colors, people, etc. I enjoy looking at things from a creative perspective and transforming it into soap. My husband and I randomly wrote a few names down and Scentsational Soaps just stood out to us. It had a ring to it. 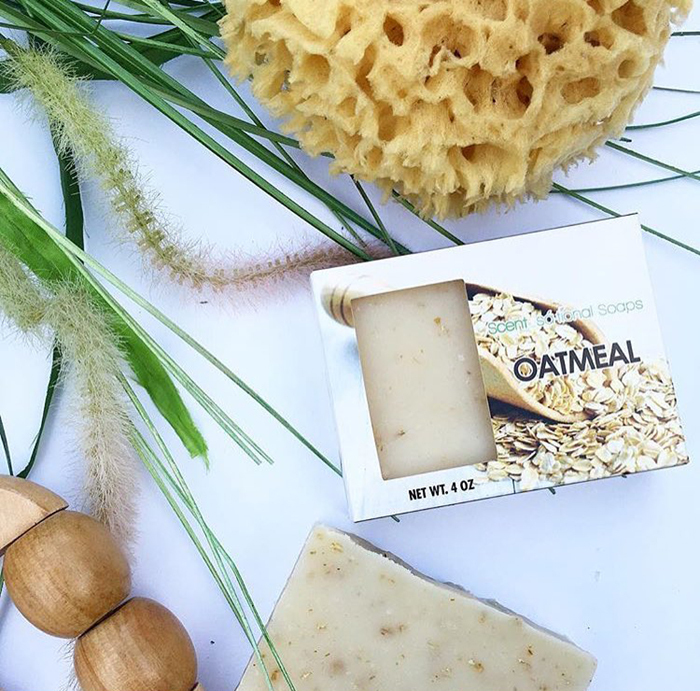 Oatmeal Soap, made with ground oats for exfoliation. 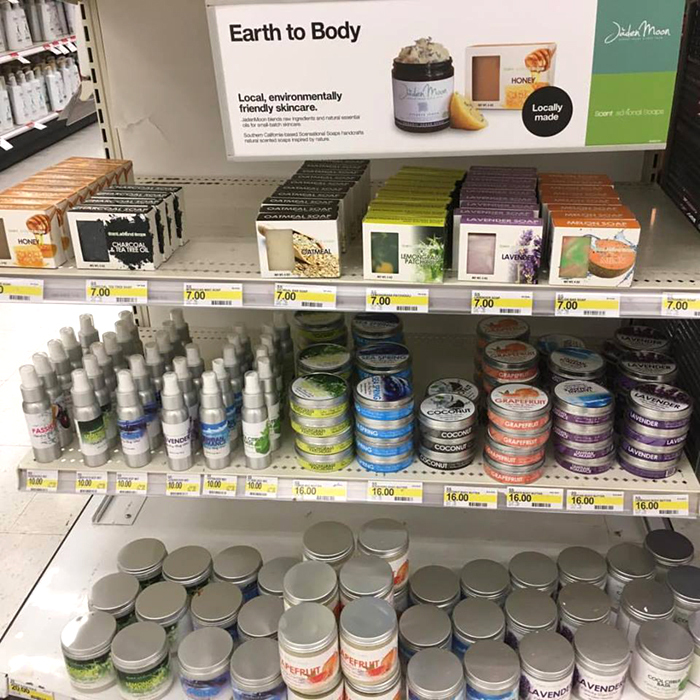 You can find your products in select Target stores. Tell us more about how this partnership happened, and what you’ve learned from it. I received a flyer from a dear friend (and was tagged by a few others) that Target was looking for local vendors. I filled out the application and unbeknownst to me, it was due the very next day. Of course, I said to myself that I wish I had more time. I filled it out and uploaded a few pics. A week later, I received an email inviting me to present my product to a panel. I was excited, nervous and blown away as I felt that I was not ready. It’s these moments where we have self doubt and it can really deter you from fulfilling your true dream. Scentsational Soaps on the shelf at Target. I presented our products and waited two weeks for their decision. It was exactly two weeks from the date of presenting that we received another email. This time, it was to congratulate us, as they welcomed the opportunity to partner with them in fall 2016 to have our products on their shelves. I couldn’t believe it! I was elated!!! Months later, the learning curve began and it was fast but steady. I definitely learned to not doubt myself, stay ready, and position myself for every opportunity imaginable. Take a chance! 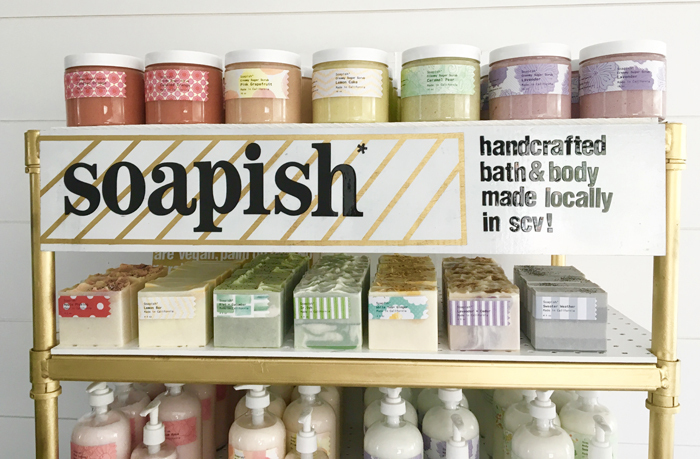 Tania of Soapish is a talented soapmaker who resides in California. Before learning to make it, Tania wasn’t a fan of bar soap. But once she tried handmade bar soap, she was instantly obsessed. 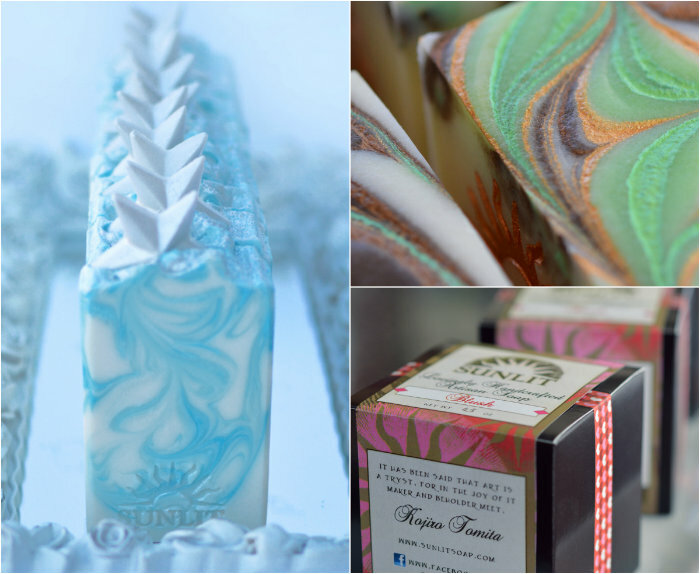 Tania creates cold process soap, lotions, scrubs, bath bombs and more. All of her gorgeous creations have a distinct point of view. You know it’s a Soapish bar just by looking at it! 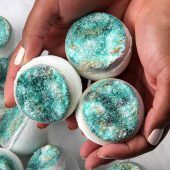 Tania shares some of her soaping projects on her YouTube channel, and creates stunning soap eye-candy on her Instagram. Learn more about Tania, including her advice for making YouTube videos and how she came up with her business name. 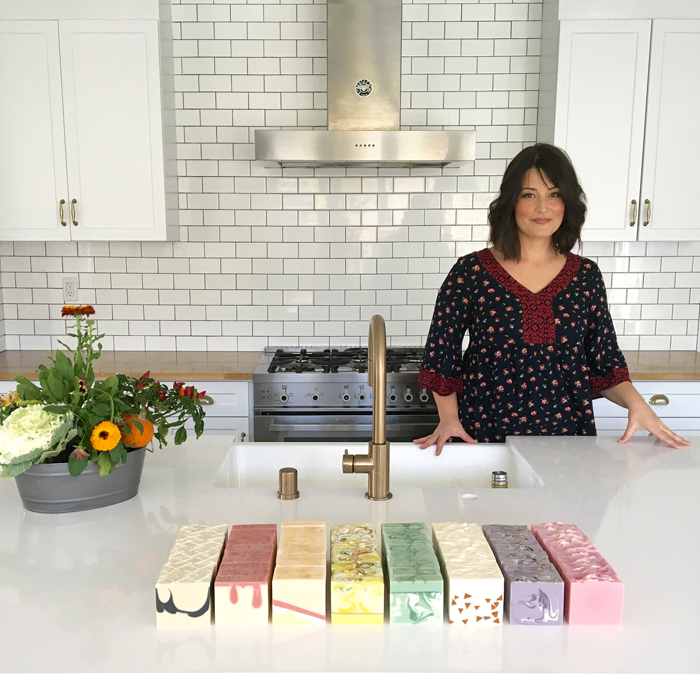 Tania in her gorgeous kitchen, along with a collection of her cold process soaps. I started soapmaking on August 11, 2013. I know the exact date because I posted a picture on Instagram of the first soap mold I built. 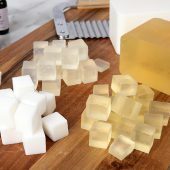 I was always fascinated by the process of making soap, and I even bought a soap making book years and years ago, but I didn’t try it right away because it seemed so intimidating! After nervously making my first few batches, I was completely addicted. Soap making was basically all I did and thought about for the next year. I joined a soap makers forum, watched every YouTube video I could find, and read and read anything about soap I could. The really funny part is that I used to hate bar soaps! All of my friends were so amused at my obsession; they all knew how much I disliked soap bars. After I tried handmade soaps, I was hooked. A beautiful Soapish display, full of soap, lotions and scrubs. The first bit of advice I would offer is to find out and follow carefully all of the labeling and insurance requirements in your area. Next, I’d say to get tons of feedback from people outside of your friends and family. Ask for unbiased thoughts and opinions on everything from the products themselves, your packaging, website, and your social media photos. That helpful advice can give you the perspective you need to successfully sell your products. Lastly, talk about your products to anyone who will listen and always carry samples. 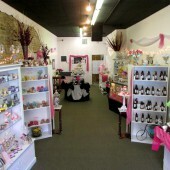 You never know when someone may be interested in having local, handmade bath and body in their shop. Cold process soaps are my favorite! Although I only make them once in awhile, I really love creating complicated designs that challenge me. My favorites are scented with anything citrus! 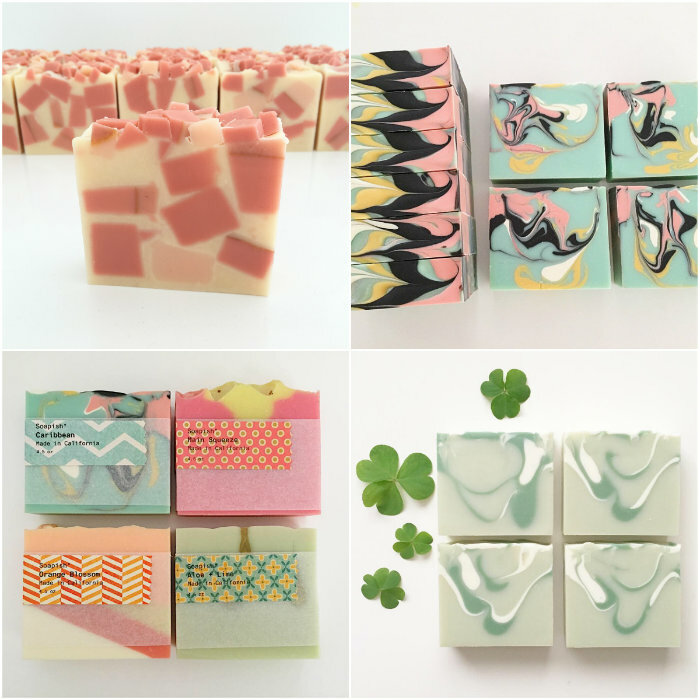 Top left, clockwise: Sweet Orange Chili & Blood Orange Soap, Caribbean Swirled Soap, St. Patrick’s Day Soap, a collection of cold process soaps. Everything around me inspires me! Flowers and plants, fashion, textiles, and photography are the top of my list. I love looking at color palettes and patterns that immediately make me want to recreate them in a bar of soap. 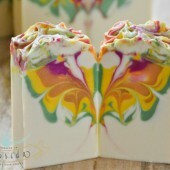 I can’t get enough of other soap makers’ photos, because they inspire me to want to create too. I’m also inspired by a challenge or necessity. I’ve found that I’m at my most creative when I’m being forced to think outside of the box. I love how clean and eye catching Tania’s packaging is. It really complements the soap! Coming up with a business name is not easy! Everything clever and catchy having to do with soap, bubbles, and baths was already taken by someone. I think it’s the Los Angeles in me, but I add “ish” to everything I say. That’s probably why “Soapish” just came to me one day. It was perfect because at the time I was starting to add lotions and scrubs to my product line, it tells people I make soap, but not only soap! Now I realize that my business name didn’t have to have the word soap or even have anything bath related in it: it just had to be individual and say something about me. You share some of your soapy projects on your YouTube channel. What is your favorite thing about making videos, and what advice do you have for those thinking about making videos? I love making videos because I love watching them. My favorite part about creating videos is that I enjoy teaching, and for those few minutes I get to teach someone something new or at least inspire them to try a technique or create. What I would tell anyone wanting to make good videos is that you don’t need fancy equipment to shoot them. I shoot my videos with my iPhone and edit them with an app right on the phone. My main recommendations for great soap videos is to always have good natural lighting, this means recording during the daytime which isn’t always convenient. I also use the editing program to cut down the long, noisy parts (that stick blender can be loud!) And lastly, always try to have a clean, uncluttered work space so your viewer can see what you’re doing without distractions. It’s really impossible to choose just one thing because there are so many that I can’t do without. If I have to choose just one it would be the Ginger Ale Fragrance Oil. It just makes me happy and it behaves extremely well for swirls and designs. What is your favorite soaping technique and why? My favorite soap technique is stripes. I love the modern look and I like the challenge of getting the lines perfectly even and straight. 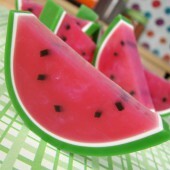 I also like that it makes a pretty soap, but not one that’s so fussy people won’t use it. Your photos have such a distinctive look. 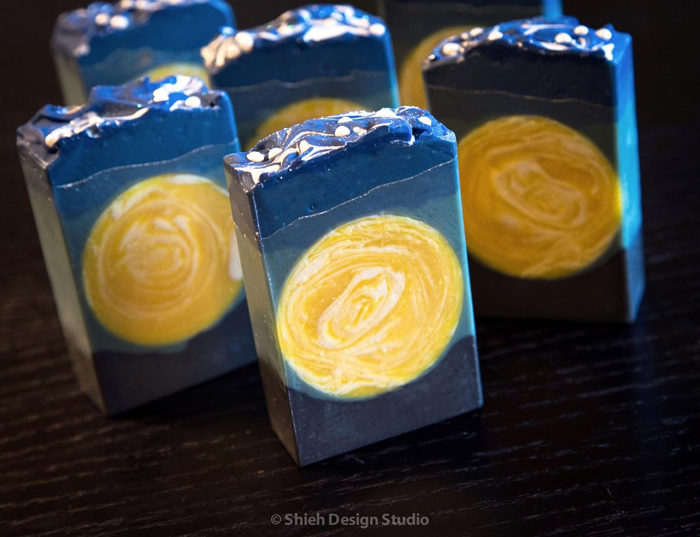 What tips do you have for photographing soap? 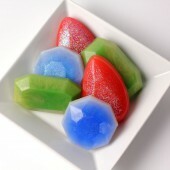 I just try to clean up the soap bars and other products nicely and present them in a way that looks good to me. After that, it’s really all about that natural lighting! People are surprised to find out that I have 4 kids; 2 girls and 2 boys. They pretty much run my life for now, haha. I’m also a power tool loving mama, and I love to build things. My dream girls night out is a stroll through Home Depot with a cup of coffee in my hand. In addition to soap making, I make and decorate cakes with sugar sculpted flowers and figurines. I love to cook and have dinner parties, and I’m also passionate about home renovating and decorating. My husband and I bought a new house a year ago and we spend most of our free time fixing, building, and painting. My absolute number one soaping tip is to know your fragrance. 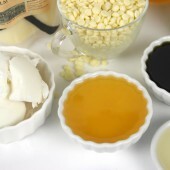 A badly behaved fragrance oil can mess up even the simplest soap. I’d say that 95% of the batches I’ve botched were due to either accelerating fragrance or discoloring fragrance. Always read the reviews carefully. If you can see photos of test results, that’s even better! If in doubt, make a tester; it could save you a huge mishap! 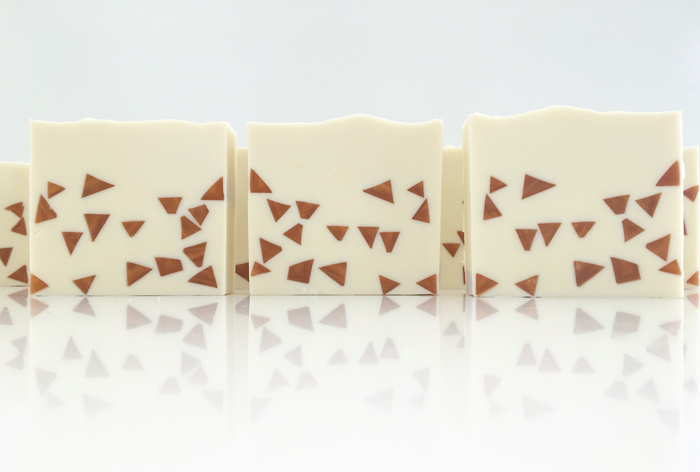 Tiny Triangle Embed Soap, scented with Energy Fragrance Oil. I have definitely had a soapy fail! I think we’ve all had those batches that go wrong. There are batches that are so stressful you start sweating and then inevitably a drop of raw soap finds a spot of your skin that’s exposed, so you have to deal with that in the middle of the chaos. When I’ve had those moments I tell myself “get it in the mold.” If I can do what I have to do to get it in the mold, I can usually make something good out of it the next day. Either I can chop it up for embeds or sometimes it turns out better than I expected. And in the worst cases, my friends get a few bars of ugly soap. These experiences also remind me to wear long sleeves when making soap! I love it when someone writes me a card or sends me a message telling me how my products have helped their skin. Being able to create these pretty things that are colorful, creative, pieces of useable art and knowing they helped someone…what more could you ask for? 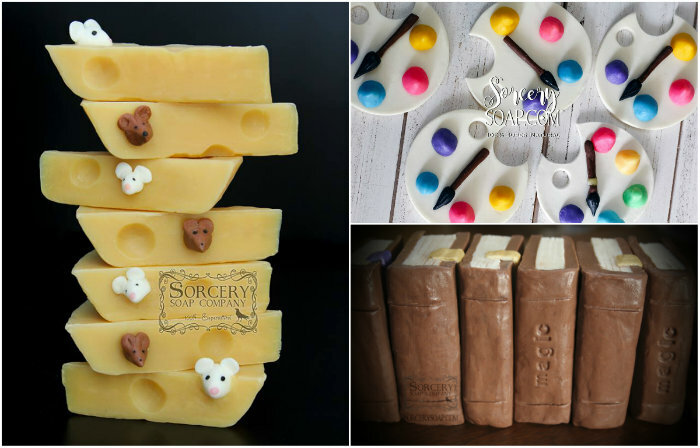 Bee of Sorcery Soap (also known as “The Soap Witch”) creates amazing products with hand molded details and shapes. She uses her own soap dough recipe to create horses, flowers, birds, books and gnomes (and so much more). Bee shares the techniques on her YouTube channel as well as her soap blog. 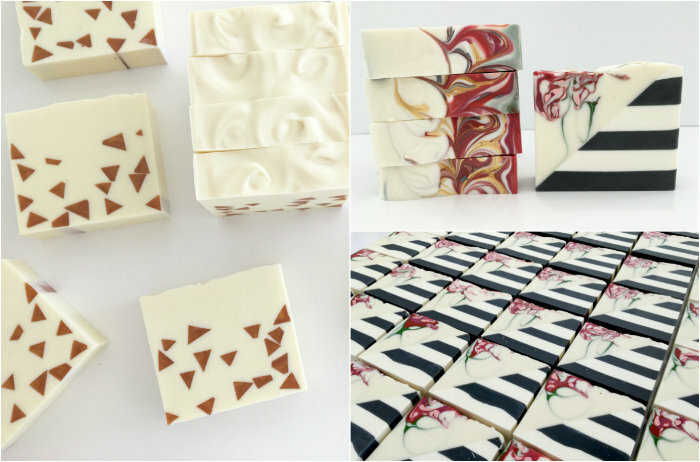 I’m in awe of each of her projects; they are extremely innovative and push the boundaries of what can be created with cold process soap! 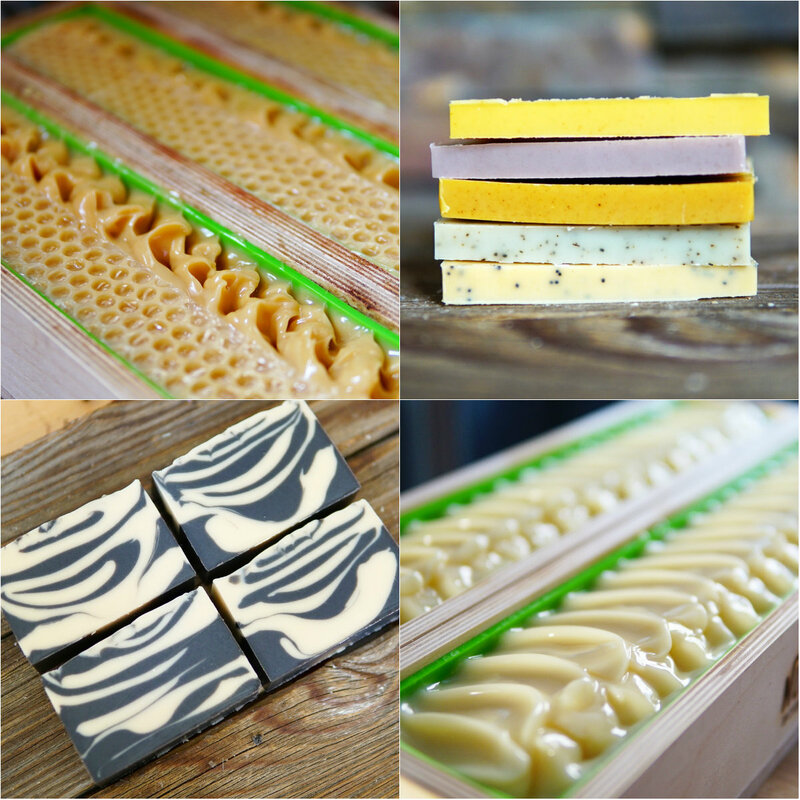 Learn more about Bee’s journey with soap dough, including her tips on getting started in the interview below. -A.M. 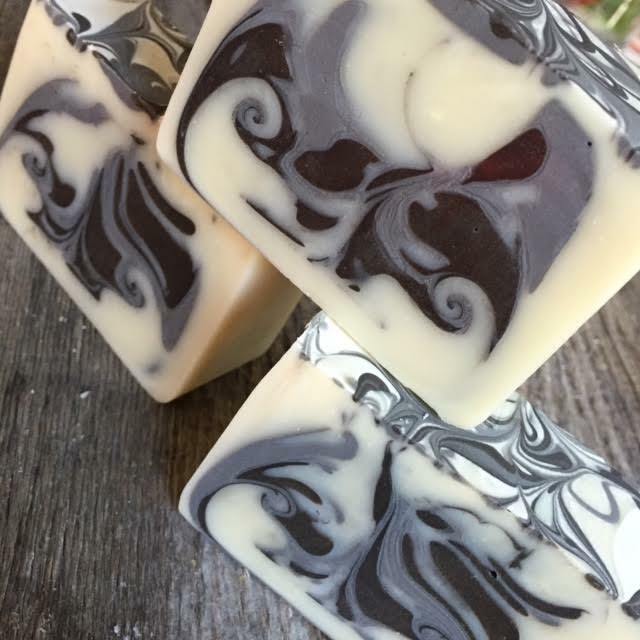 The first time I made soap was with Bramble Berry’s cold process soap kit on August 24, 2014, to be exact. Anne-Marie’s Soap Queen TV fascinated me and I trusted her information. 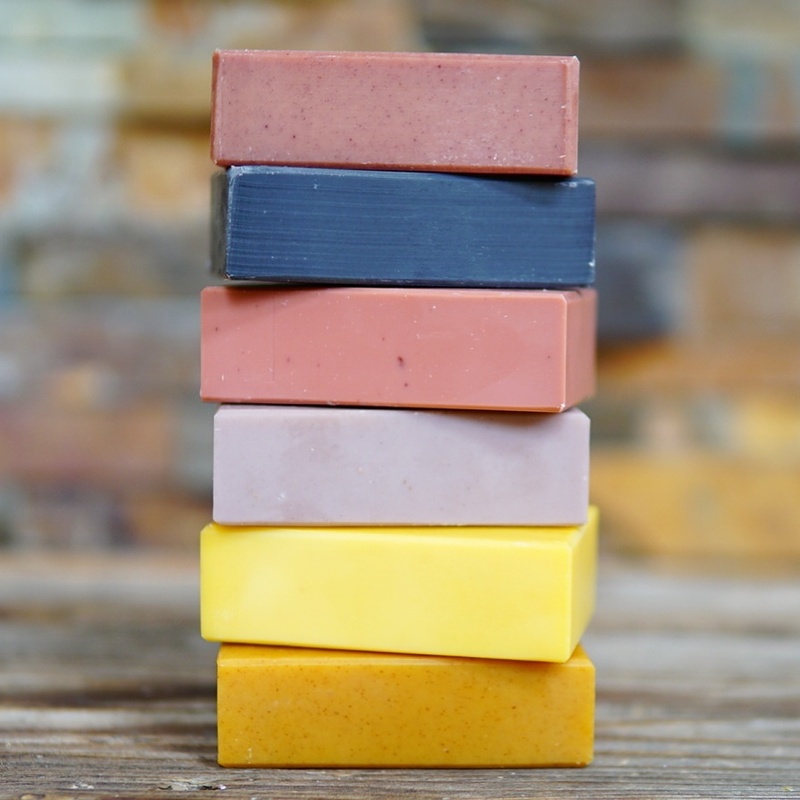 I studied soap for almost a year before I began, and watched every video Anne-Marie offered. The clear instructions in the kit helped to calm any slight apprehensions I had about using lye for the first time. I was so excited and thrilled my hands were shaking. Do not quit. Observe the resistances that arise, observe your thoughts and emotions and move forward. Each step there is something to learn, possibly something so new you are the only one to see it. Stay observant and you won’t miss these subtle and important experiences. 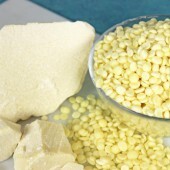 Cold process soap dough. 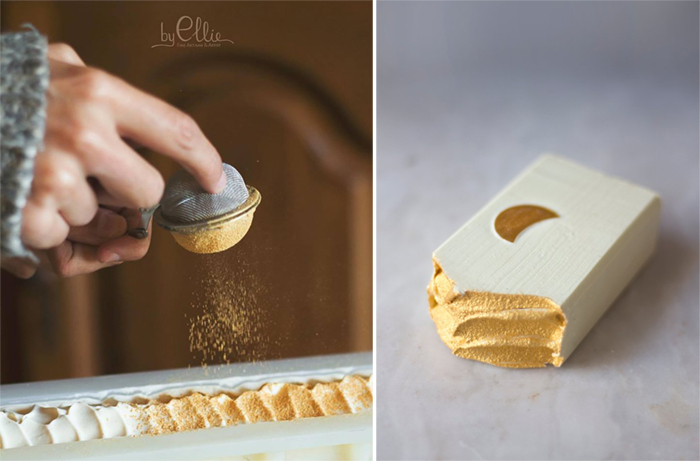 This is a specific soap recipe that is not allowed to cure until embeds, soap cookies or embellishments are molded and then exposed to the air. 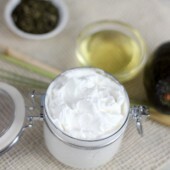 If created correctly its the perfect balance of hard and soft butters and oils. 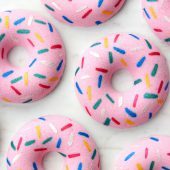 Soap dough is smooth and moldable and the consistency is a cross between clay and fondant, and a unique substance that is truly interesting to me. 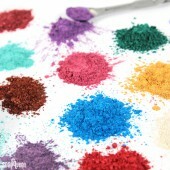 I love the colors, the feeling of it and the endless creative possibilities. Caitlin of Revive Bath & Body started making soap in high school and continued to sell soap at farmers markets throughout college. 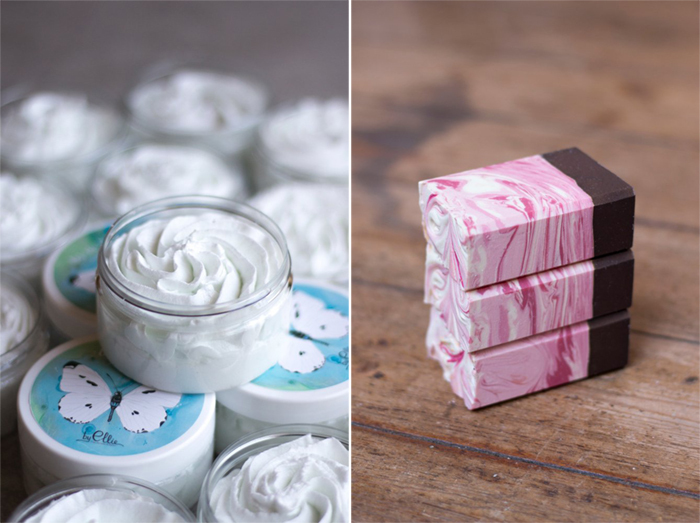 After school, she turned her soaping hobby into a full-time job. 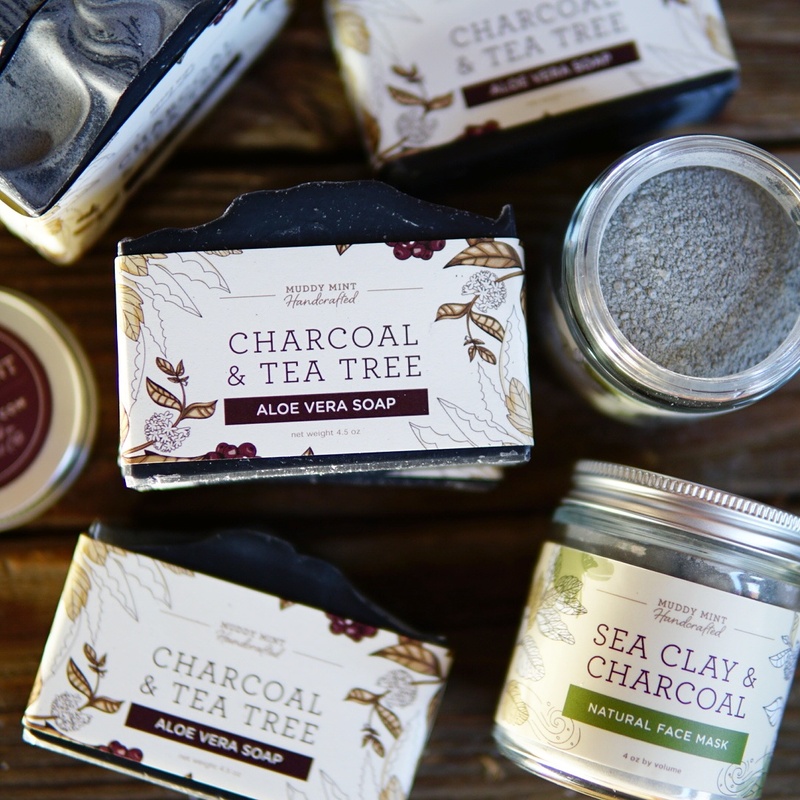 Revive Bath & Body specializes in natural cold process soaps and other products including body creams, bath soaks and more. 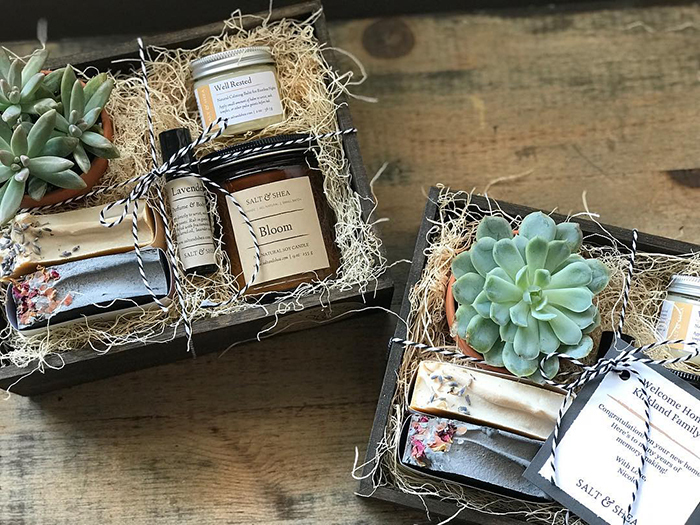 In addition to having great products, a portion of the proceeds go to HavenATL; an organization in Atlanta that works to help women exiting trafficking. Earlier this year, Caitlin and her team produced 19,392 bars of soap in 8 weeks to be sold at Hobby Lobby across the country. Read more about Caitlin and her incredible success story below! 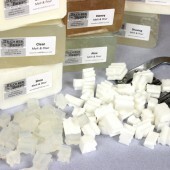 -A.M.
My soap making journey began when I was given a soap making kit in high school. I loved creating something that was useful. After a year or so, my parents encouraged me to sign up and sell my creations at a local farmers market. Needless to say, the soaps were a huge hit in my town! I went to Kennesaw State University where I studied business management and entrepreneurship. I sold soaps at markets all over town, which allowed me to graduate with no student loans! After my graduation in 2014, my parents again encouraged me to keep going with my little hobby and see if I could take what I learned in college and turn this passion into a business. I gave myself one year after graduation to see if I could create something sustainable. In that one year, we exhibited at our first trade show, and I hired my first employee! Revive is still growing, and I love that my hobby has turned into a business. 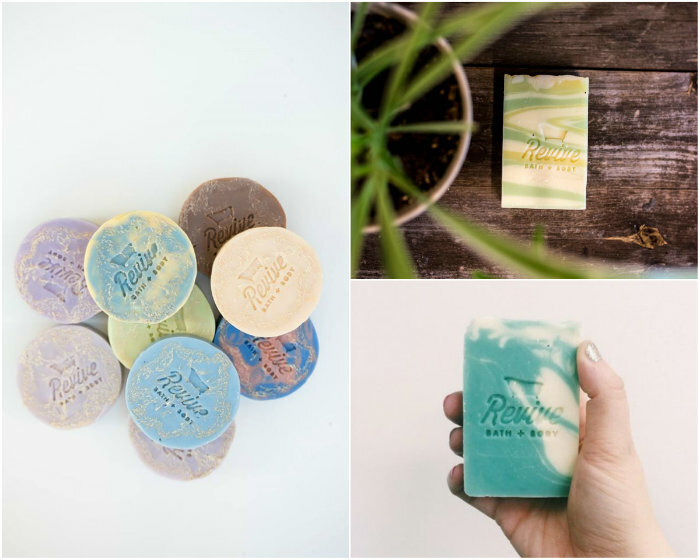 Revive Bath & Body carries a wide variety of cold process soaps; see them all here. Don’t let other people talk you out of going after your dream. When I was younger and soaping was just a part-time job and hobby of mine, there were some really mean things said to me like “You’re too young, you don’t know what you’re doing, this craft won’t amount to anything…etc,” which is just horrible! Even one of my professors in college told me to “get a real job.” I took those comments with a grain of salt and kept going. I even emailed that same professor after this Hobby Lobby order to let him know exactly how much soap I’ve been selling recently. He was quite surprised! So my advice is to just KEEP GOING. 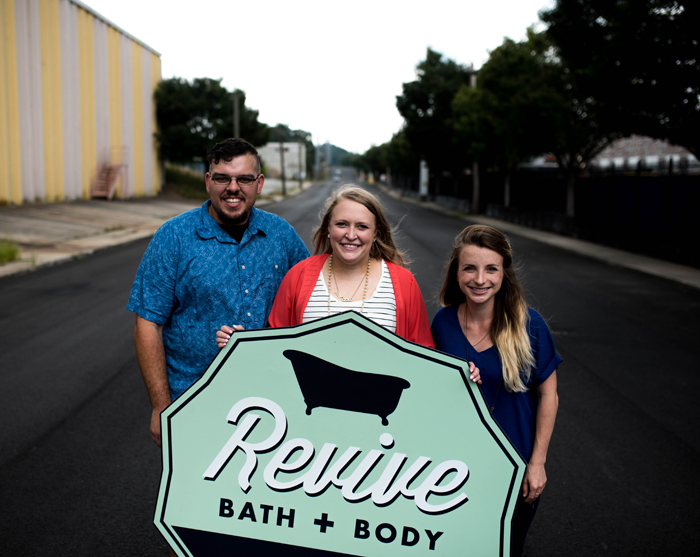 You can find Revive Bath & Body products at Hobby Lobby locations across the U.S. Caitlin and her team only had 8 weeks to create nearly 20,000 bars of soap! Your products are now being sold in Hobby Lobby locations across the country. That is so exciting! How did it happen? The Hobby Lobby buying team found me at the America’s Mart trade show in Atlanta, GA during the January 2016 show. We work with a rep group and have our products in a permanent showroom at the mart so we are not in temporaries. 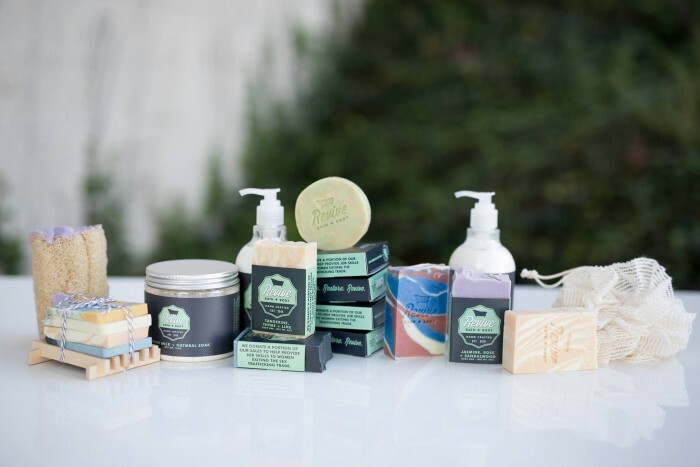 A really sweet lady approached me and my products, so I began telling her all about the soaps, a few of the other products, and why they sell great in boutiques. Then I asked her what the name of her store was and she handed me her business card. I freaked out! She said she was totally interested in our products and particularly because they are a give back item. I got the sales manager for my showroom who now manages her account. Because of the rules of the showroom, I do interact with the buyer, but the sales manager does manage her account. It’s actually nice having that mediator since I haven’t worked with many key retailers before; I was able to ask questions to the sales manager that I had no idea about. Once the January show was over, I sent samples of the requested items to the Hobby Lobby buying team. Once they got the samples, they let me know how many units they were interested in purchasing, and then we went into price negotiations for such a bulk order. 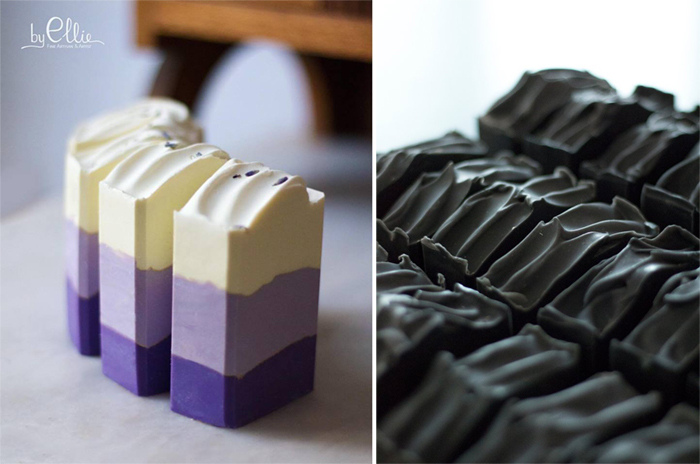 Their initial order ended up being nearly 20,000 bars of soap (entirely handmade!). We negotiated on price, but they didn’t try to nickel and dime me for every single thing like I hear a lot of key retailers do. The buying team there is very fair and even though they do have 718 locations, I can tell they truly care about the individual behind the products. They paid me on time which almost never happens with big box companies. I have thoroughly enjoyed working with them and couldn’t have asked to work and continue to work with a better key retailer. 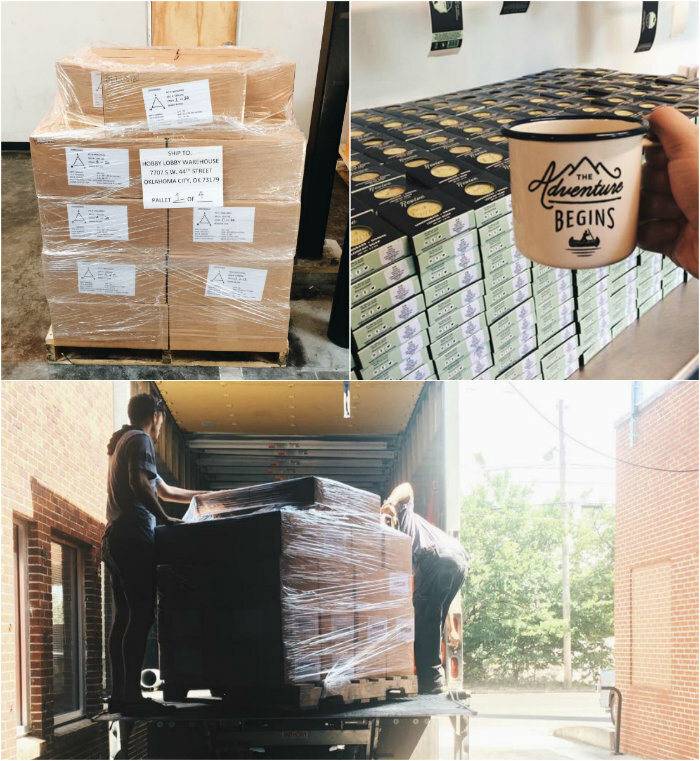 Can you tell us a little bit about the process of making such a massive order? Well, one thing I did learn in business school is about demand and capacity of a business. A business can only produce so many products per day based on their capacity. However, that professor also said when a big box store comes knocking, never say no and figure out how you’re going to get it done…and that is exactly what I did. Their order was nearly 20,000 bars of soap. I gave myself a goal to have that order completed in 8 weeks time. Then I had to break it down into how many bars per week and per day that my team and I had to make. Everything didn’t go as scheduled, there were bad batches, and there were times I didn’t think we were going to finish. But just like I mentioned above, I kept on going and going and we shipped all of their products on time! 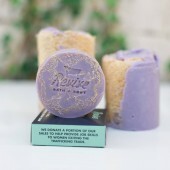 A collection of Revive Bath & Body products, including cold process soap, body cream and bath soaks. 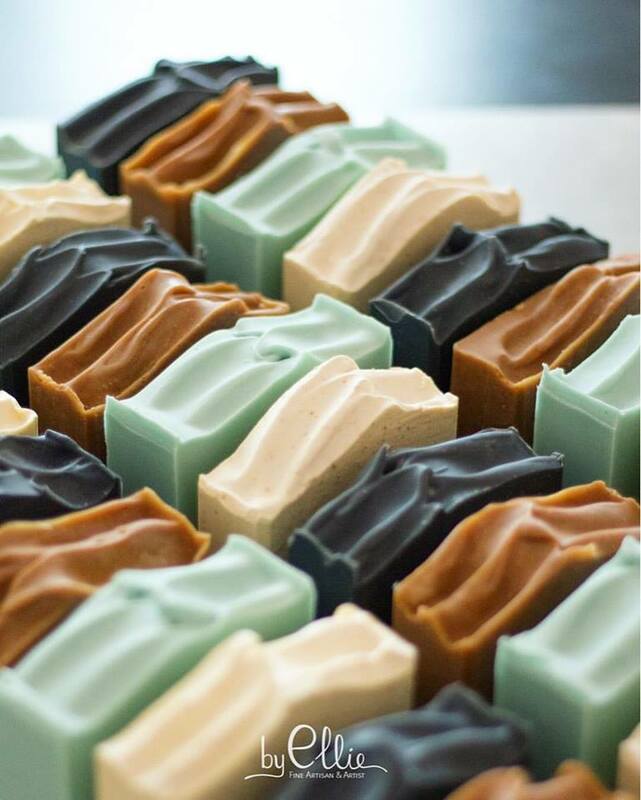 What tips do you have for somebody who wants to sell their soap wholesale? I think a lot of people in general are afraid to ask for help. 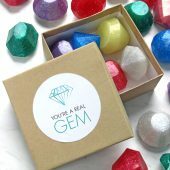 There are so many great resources on the web that help people prepare their craft for wholesale. Doing a little Google search, reaching out to local boutiques with questions, attending trade shows, and making sure your pricing is right is all very important. People want to to succeed more than they want you to fail – you just have to get over the fear of other people. Pick up your phone and call all your local boutiques! You can’t let fear overcome you. For every 10 no’s you receive, someone will say yes. Oh man, this is a tough one! I do have a team of people that are basically producing all of our products now while I take care of the business side of things. However, I love jumping in to create our essential oil blends. It’s so therapeutic to make something with your hands after spending most of the day doing paperwork and on top of that, mixing and working with the essential oils just puts my mind at ease. Honestly, I think my it’s my community that keeps me going and creating. I’m an extremely goal-driven person, so when I set a goal for myself, I can’t move on until I accomplish that. One of my goals was to get my products into 250 stores…well now we’re in nearly 900! I also love looking for trends in the marketplace and thinking “that’s a good idea..now how can I do it better.” That also gets my creative mind going. We have some really exciting products coming up for later this year and early 2017. There is something so therapeutic about pouring soap! 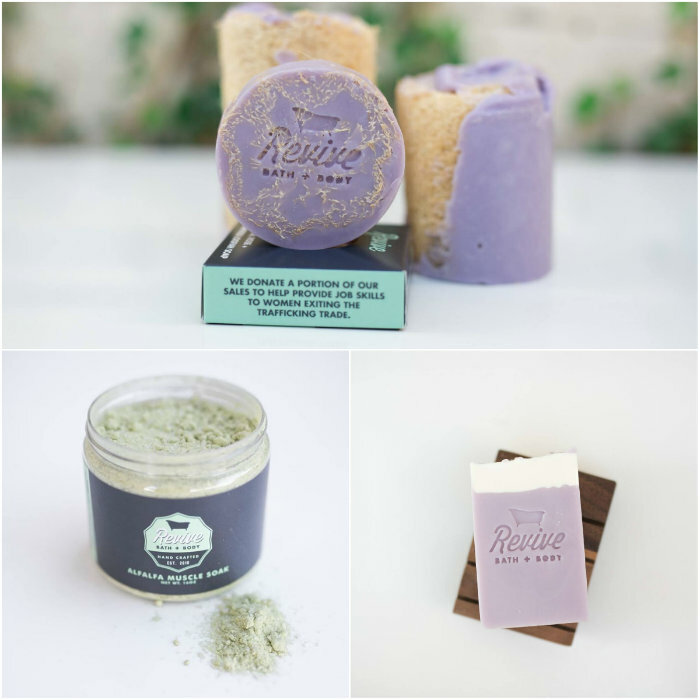 Here, the Revive Bath & Body team pours Patchouli Litsea + Lavender Cold Process Soap. The name Revive was something I came up with in high school in a graphic design class. As I was preparing for my first farmer’s market, I knew I needed a ‘business name’ so Revive came to me – at first I used the name because it stood for ‘reviving’ people’s body care. Now we are partnered with a nonprofit that gives back to women and gives them the opportunities to work hard and provide for themselves. Revive has a much deeper meaning than just reviving people’s body care now…it also means when you purchase one of my products you are ‘reviving’ a girl’s life with opportunity. My parents always told me they thought I would be an entrepreneur. When I asked why, they reminded me of the business I started in 5th grade. Instead of giving my friends friendship bracelets, I created an order form and a business where my friends would actually pay me for the bracelets I would make for them. I would upcharge them based on the color of tread and the design of the bracelet. One day my 5th grade teacher found out my friends were buying bracelets from me with their lunch money and she shut my business down. But my parents always said since that moment, they always knew I would own a business. I live in Atlanta, GA where entrepreneurship is bursting at the seams! I love being involved in different events around the city that involve startups. I also have the cutest goldendoodle ever named Piper who basically goes everywhere with me. I also enjoy spending my Saturdays on the couch with a good book. 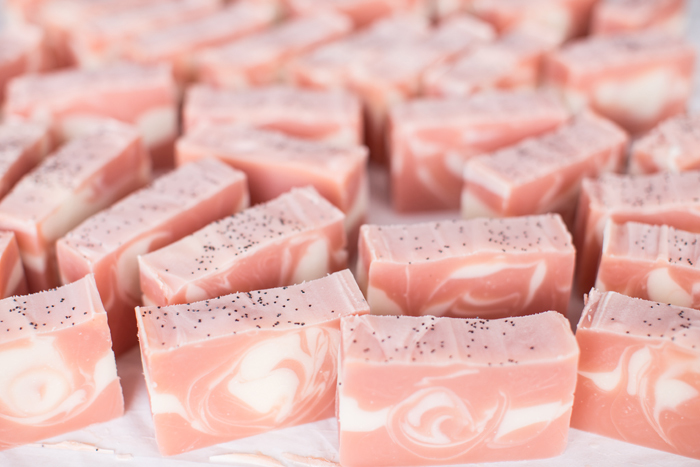 Don’t package your soaps before they’ve had ample time to cure. And when that big box store comes knocking, do not skimp on quality. The quality of your products got you to this point so whether you are making 10 bars or 20,000 bars, the quality should be consistent. 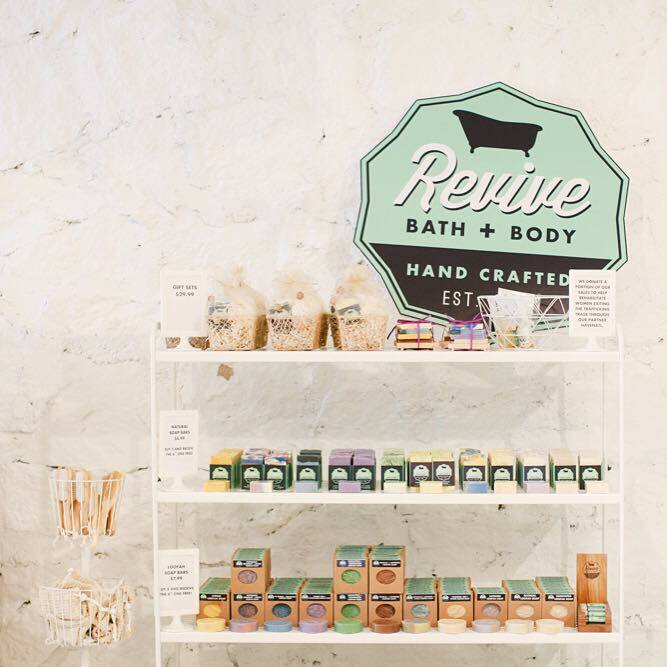 Revive Bath & Body is also found in several retail locations, click here to see their retail locations. Of course I have! About two years ago, I was rushing and soaped when my lye was too hot. It created a soap volcano alllllll over my floor. I just let the soap do its thing and threw the whole thing away. Sometimes it’s just better to start from scratch with a new perspective! I think my favorite thing is the diversity of the products on the marketplace. You can literally create anything you want…the options are endless! 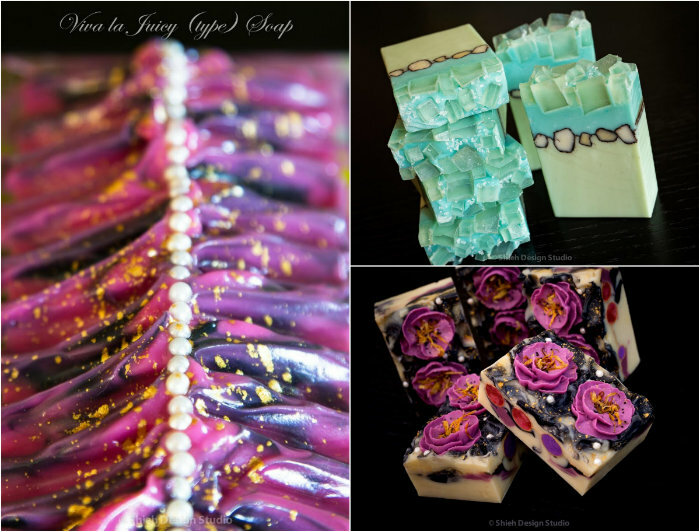 Emily of Shieh Design Studio and Soap and Restless is well known in the soaping community for her gorgeous creations. Emily is a masterful soaper and has a keen eye for design. 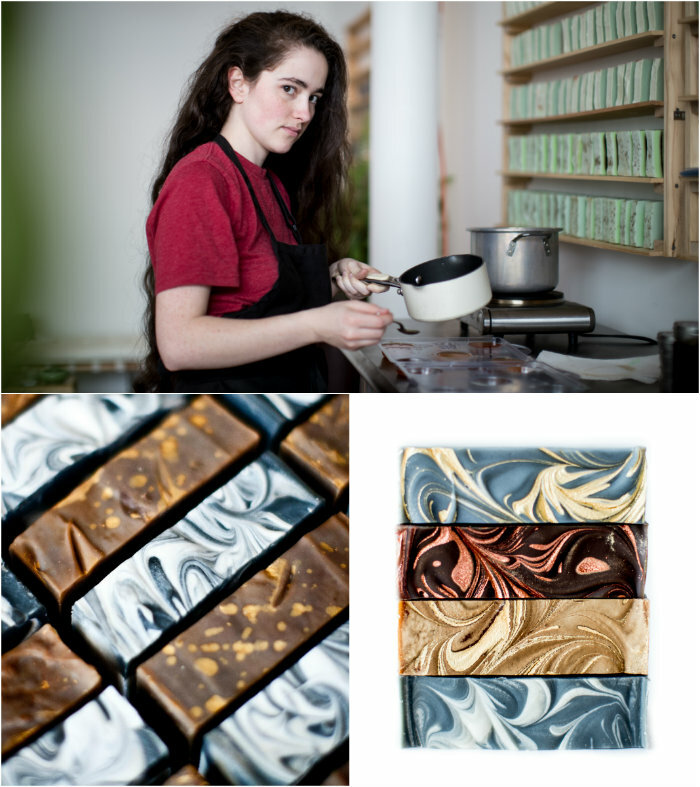 In fact, Emily is a designer at an architecture firm, and her skills show in every bar of soap. Emily’s product photography also sets her items apart – check out her beautiful photos to see what I mean! To learn more about Emily, including her photography tips and advice for starting a blog, in the interview below. 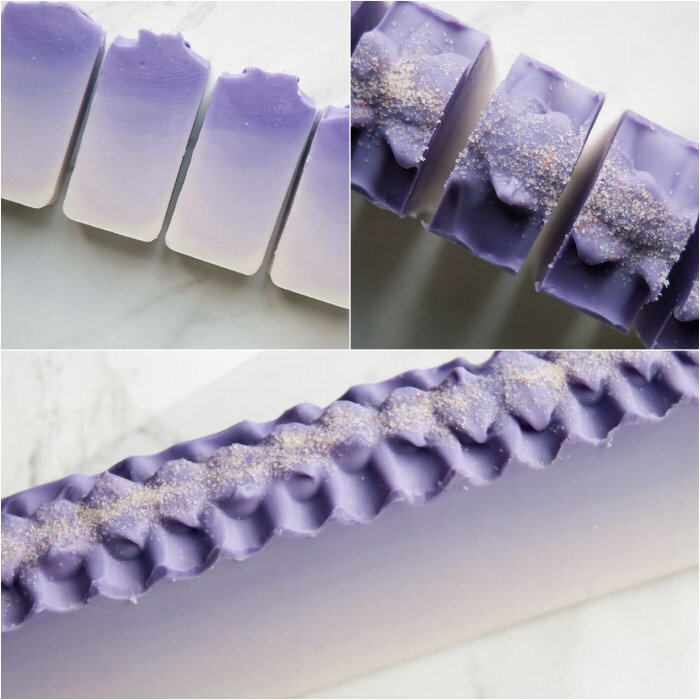 -A.M.
Emily’s gorgeous Honey Moon Soap, watch her make it here! I started soaping in the summer of 2010, it would be 6 years in a few months. I don’t have a fancy story of how I started making my own soap from scratch, just simply not satisfied with the feel and scent commercial wash left on my skin. What really caught my interest in making my own soap and other bath & body products is that the OCD me loves the idea of having total control. 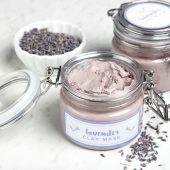 I love how I can personalize every aspect of my bath & body products from the way it looks to the way it smells and feels. To be honest, selling bath & body products is never my main source of income, it’s more of an obsession and hobby than anything. I’m not really good at running profitable business, I’m afraid to give any business advice. However, I’ve always t​old myself to keep an open mind. There is so much to learn in making bath & body products, even the most experienced senior soap makers can learn a thing or 2 every so often. 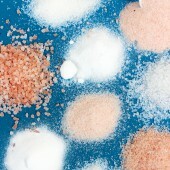 The science and art of making soap, or any bath & body products in the matter of fact, is endless. With an open mind, your possibility is limitless. Preston and Tyler of Sudz by Studz create and sell gorgeous cold process soap, lotion and balms in Sacramento, California. 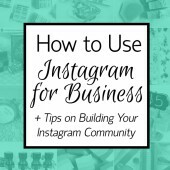 I met Preston at the Central Soapers Workshop last year, where he gave an engaging talk on Instagram and business. I was impressed and inspired by his passion for the industry. 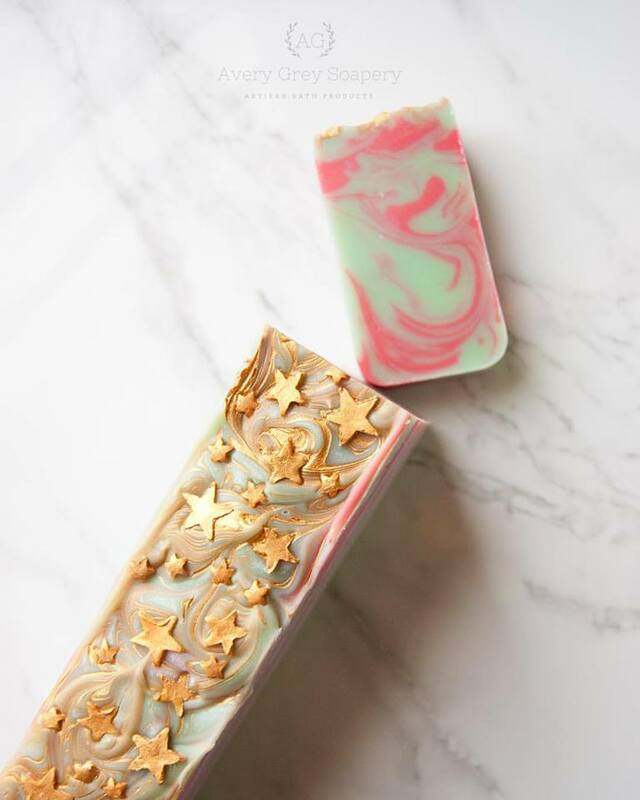 Tyler and Preston recently started a clever monthly subscription box called “Soap of the Month,” where customers can receive a bar of limited edition cold process soap. 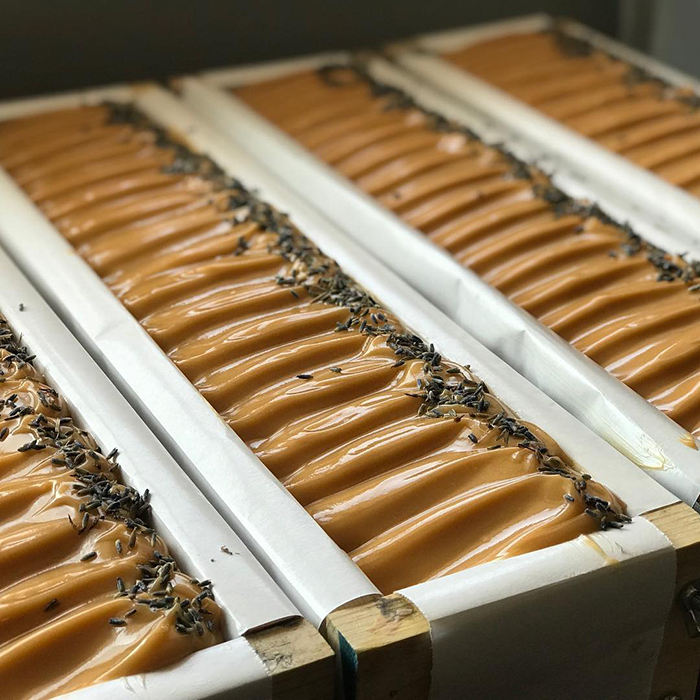 Read the interview with Preston and Tyler below to learn more about their soaping journey and tips for those just starting out. 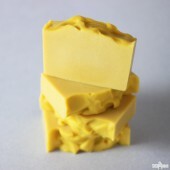 -A.M.
Sudz by Studz’s beautiful Gingerlee soap. As of this month, we’ve been soaping for three years. 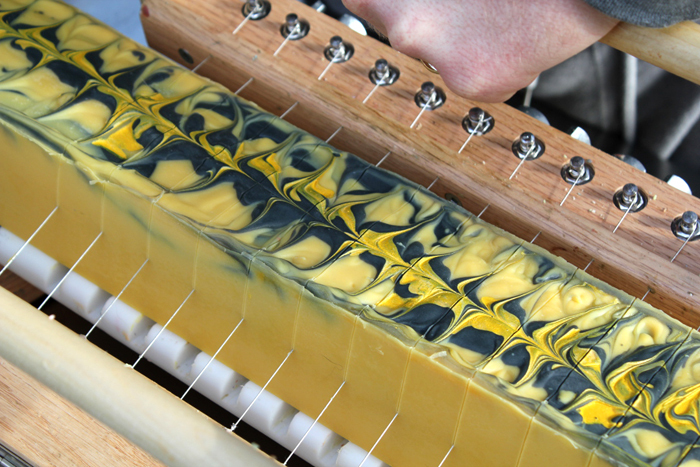 Our journey as soapmakers started shortly after we took a course on cold process soap making. At the time, Stud Preston was getting ready to graduate with a degree in philosophy and Stud Tyler had just moved back to Sacramento after having been on NBC’s The Voice and living in LA. We found that making soap was an enigmatic process; it combined art and chemistry in the most cathartic way, so we knew it had to become a mainstay in our lives. Consequently, we ordered $200 worth of supplies to start and became super addicted. Our newfound hobby was overrunning our lives, and outgrowing our studio apartment, so we decided to turn it in to a business. Preston and Tyler work together to create their beautiful products. 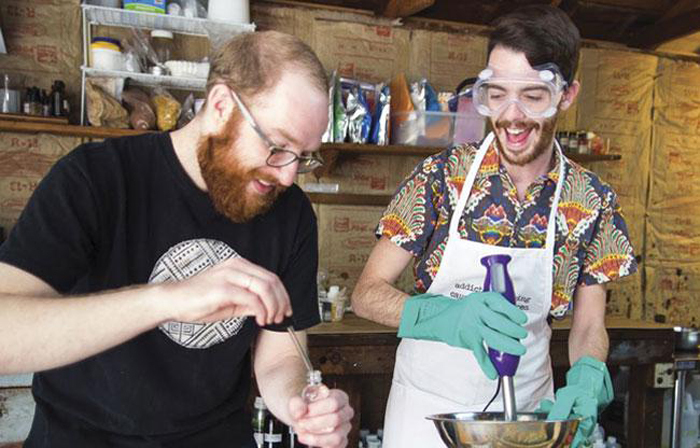 Soapmaking is the perfect combination of science and art. It requires a keen eye for design, and understanding of the chemical process. 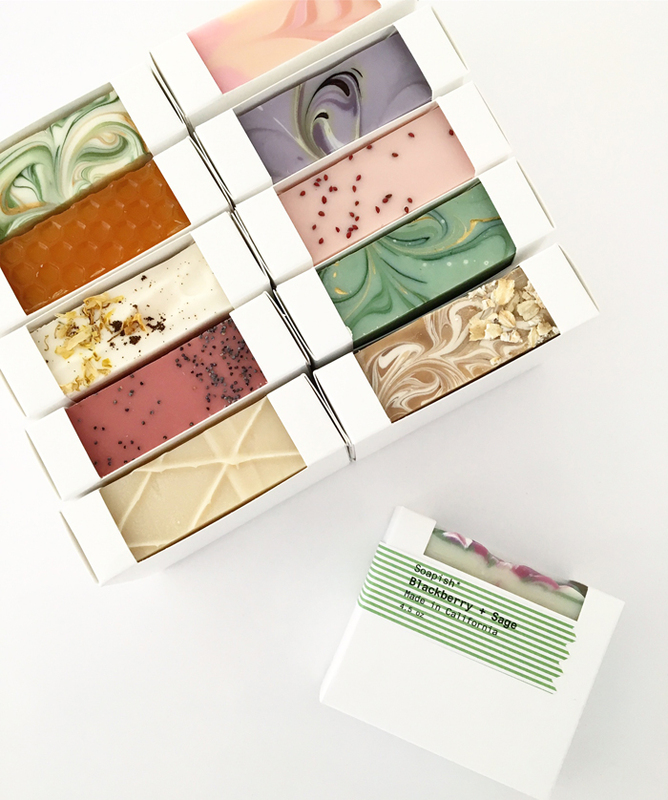 One soaper who consistently shows mastery in both the artistic and technical sides of soaping is Clara Lindberg of Auntie Clara’s Handcrafted Cosmetics. Clara’s soap is consistently stunning. 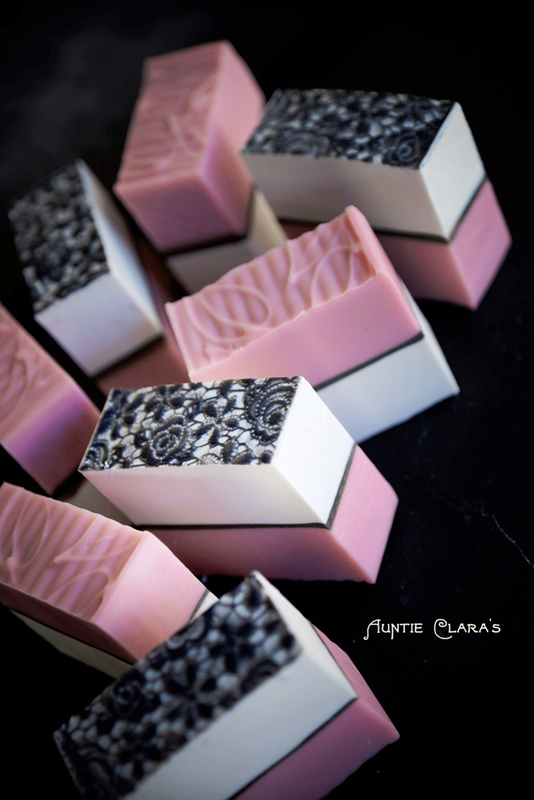 In particular, Clara is known for her lace soaps (shown below). 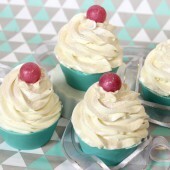 Clara is incredibly generous with her techniques, and shares many of them on her blog. You can find the tutorial for her silicone lace mats here, which inspired the Jasmine Lace Cold Process Tutorial. Read my interview with Clara below to learn more about her creative process, and advice for beginning soapers. 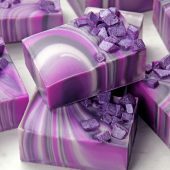 -A.M.
Auntie Clara’s stunning Mexican Lace Soap, fragranced with a Black Raspberry Vanilla Fragrance Oil blend. How long have you been soaping for, and how did you get started? 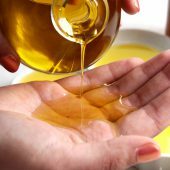 Over the following week I spent quite a bit of time reading up on soaping properties of oils and practicing how to calculate lye and lye discount (pen, paper, SAP chart, and calculator method), and once I felt I was on top of that I made my first batch. 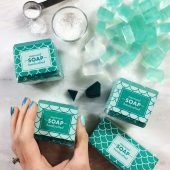 It was a soap I had formulated myself; it was a rush with a great sense of empowerment and I loved that first soap almost as much as I loved my newborn children. I’ve made some decent soap since, but no other soap have I been as proud of as that first one. Do your research well – and don’t make assumptions. In-depth knowledge of materials, processes, production, suppliers and the ins and outs of your market is invaluable. Of course, you will learn as you go, but when I hear people say “I can’t afford to experiment,” and “I don’t have time to read up and research,” I always wonder how you can afford NOT to experiment and research. Knowledge is a great asset and a small experiment gone south is always going to be less costly than a big commitment that doesn’t work out. A few weeks ago, we received a kind message on Facebook from Shana of Bathvs (pronounced Bath-us). Shana was the winner of our Facebook Photo of the Week in June of 2014, and explained to us how the win encouraged her to push forward with her business. Nearly a year and a half later, Shana has turned her business into a full-time job. It’s easy to see why Shana has had so much success; her products are stunning, her photography is gorgeous and her branding is instantly recognizable. 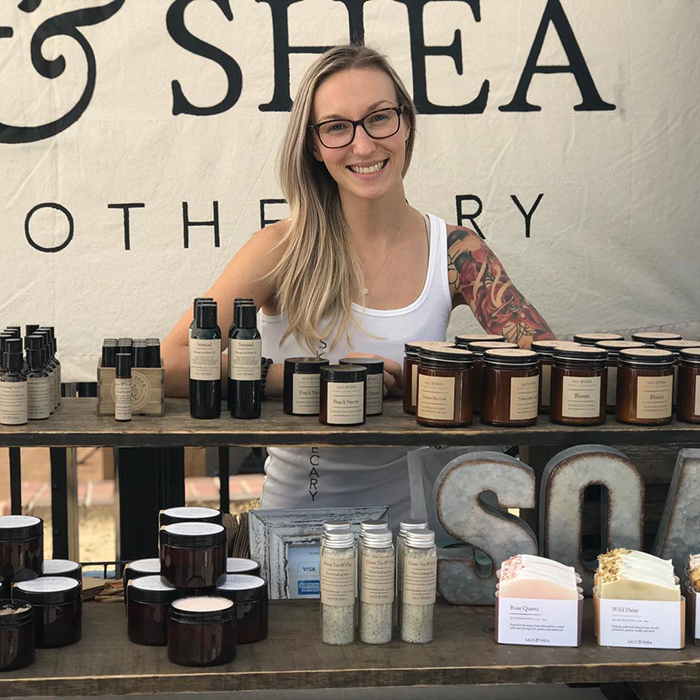 Read this interview to learn more about Shana and her soaping journey below! -A.M. 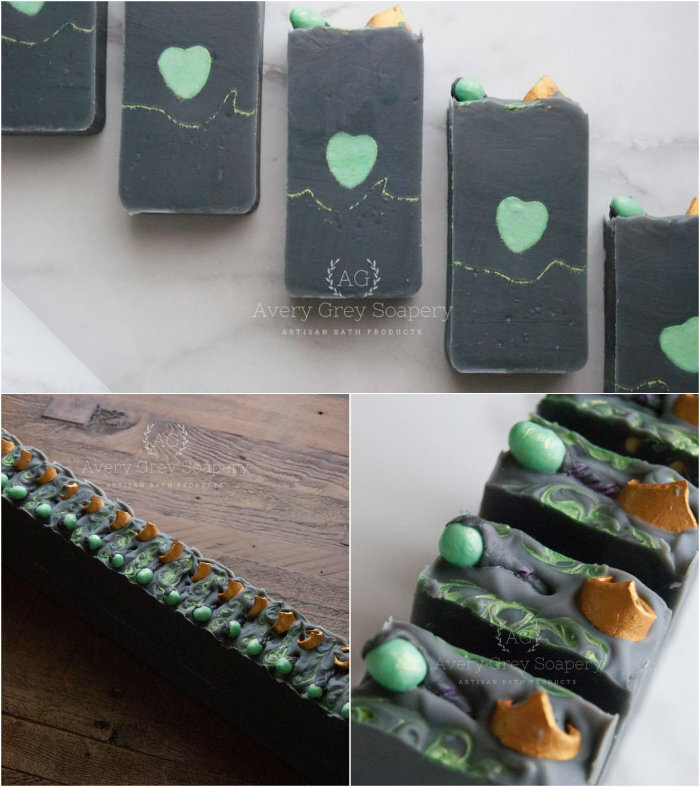 These gorgeous Obsidian bars are the soaps that led Shana to win Facebook Photo of the Week in 2014. 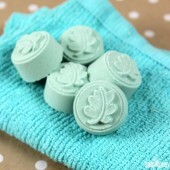 My first experiences with soap making were when I was around 11 or 12 years old. 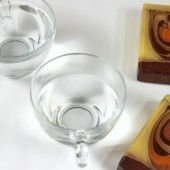 At that time I was limited to only doing melt and pour soaps, since other methods were not accessible to me. I was absolutely obsessed, and had even done a market or two with success. Since I was still just a kid, I moved away from it and had to focus on other aspects of growing up, like friends and school. Over the years I periodically would research cold process soap making and dream about all the cool soaps I could make. After I graduated from college in 2013, I had a 6-month grace period before loan repayment, so I decided to get back into touch with some of the things I had enjoyed years before. 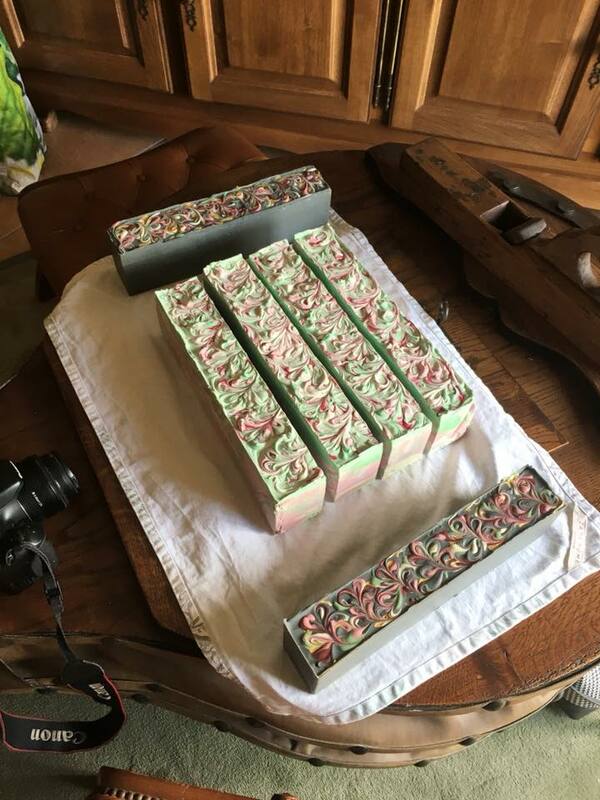 That was the summer I had placed my first Bramble Berry order and jumped into the world of cold process soap making, not quite knowing at the time where I would end up going with it. On the top, Shana is soaping up a storm! On the bottom are a variety of gorgeous cold process bars. I love the mica painting. Making goals is so important. I keep multiple notebooks just for my goals. They can be simple to-do lists, as well as lists of shops and companies to contact in the future about selling my products, etc. I also find it helpful to write down goals that seem far away; you’ll find that as you complete the easier goals, you will become that much closer to the more difficult ones. Shana’s Lychee Tea bars, made with a soft pink swirl and topped with poppy seeds. 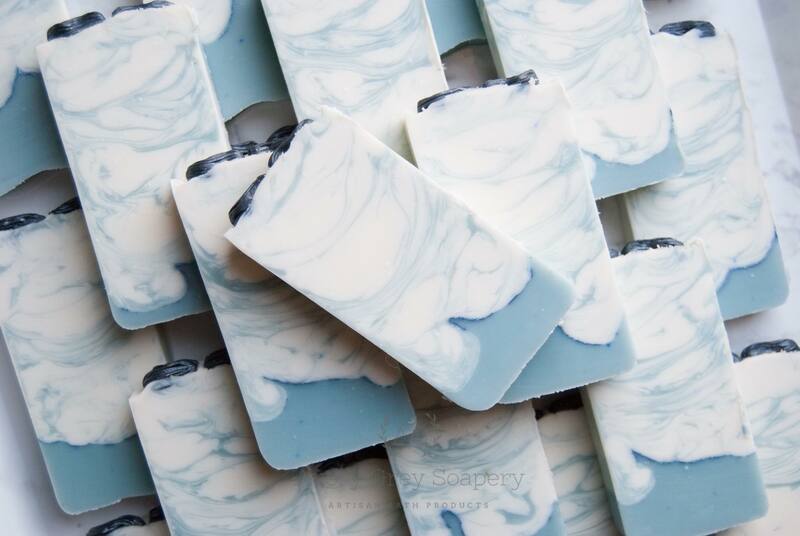 Melissa of Hallowell Soap Works has built a name for herself in the soaping community with her gorgeous products. 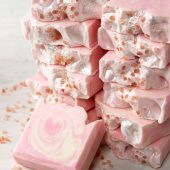 Melissa creates a wide range of stunning items, including cold process soap, lip balms, bath bombs and more. 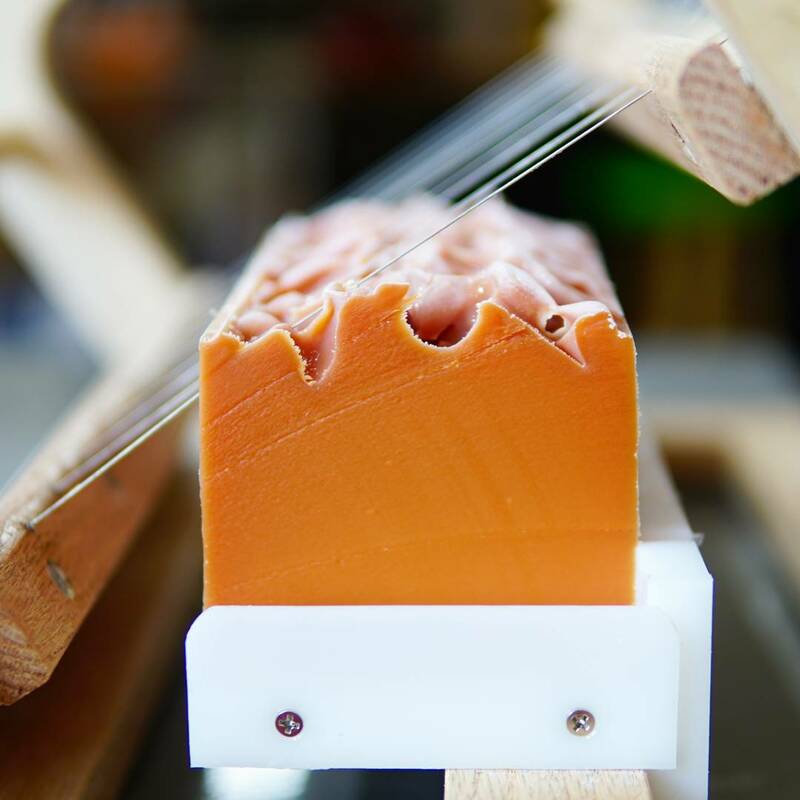 In particular, Hallowell Soap Works is known for their signature “strong arm swirl.” The swirl features a pronounced wave-like swirl that resembles a flexing arm. It’s absolutely beautiful! 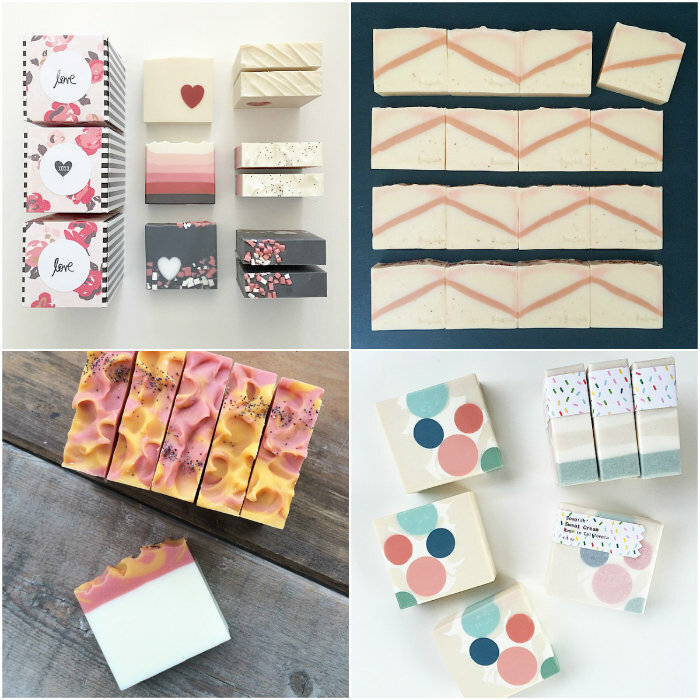 Learn more about Melissa and her soapy business in the interview below. 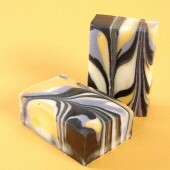 -A.M.
Melissa’s beautiful and unique “strong arm swirl” in the Tall, Dark & Handsome cold process soap. I started making soap less than a year ago, and fell in love instantly with the process. I couldn’t stop watching YouTube videos, reading Soap Queen blog posts, or purchasing everything I needed to make (what seemed) like every type of soap possible. Despite my business education, I am a creative person at heart. The process of choosing fragrances, colors, and oils felt like the perfect balance of science and art. Initially it became very overwhelming, and so I had to set limitations on what I could expect of myself. 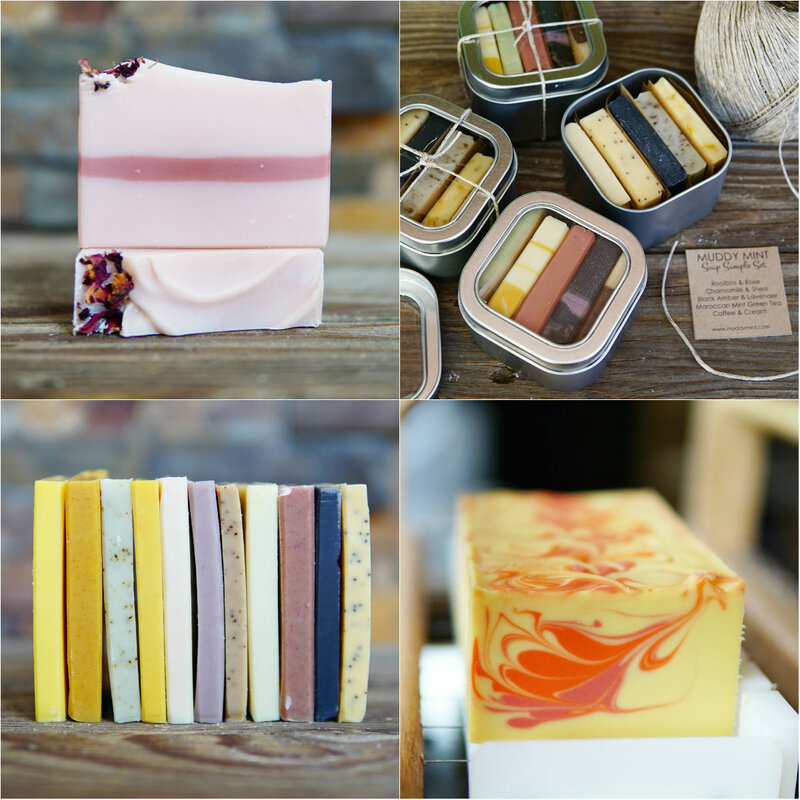 A collection of Hallowell Soap Works’ gorgeous cold process soap. 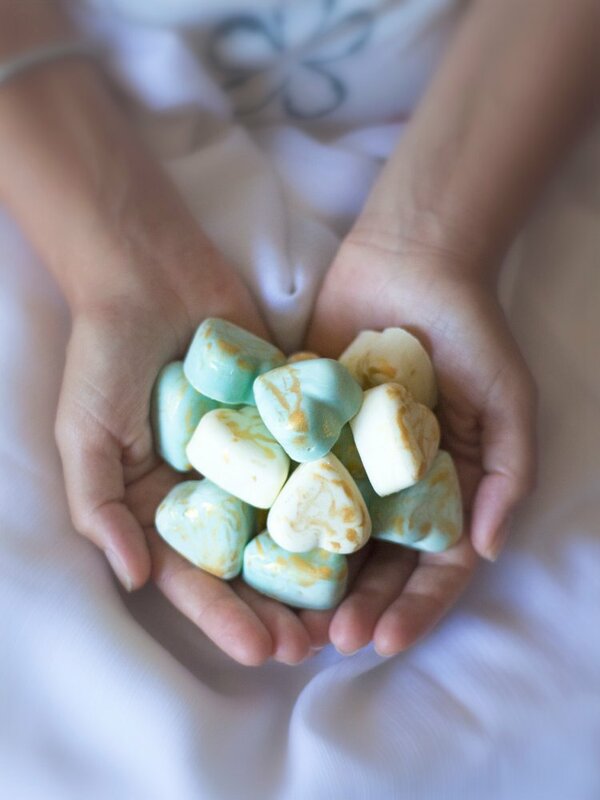 This photo was also a #SoapShare winner!